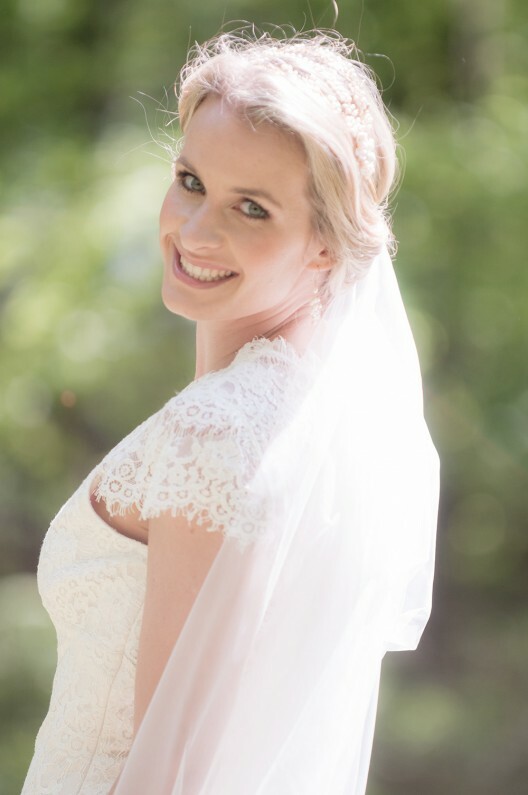 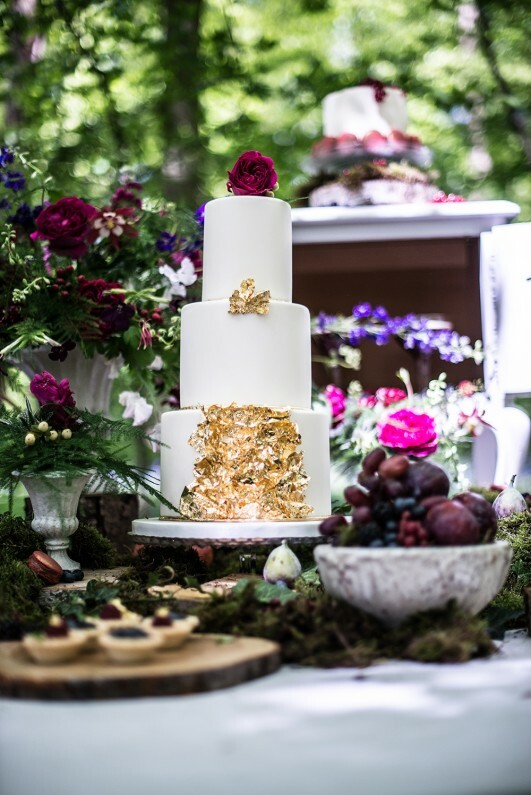 Working in the wedding world has many many privileges and one of them is that I’m fortunate enough to meet so many talented and exceptionally passionate wedding professionals. 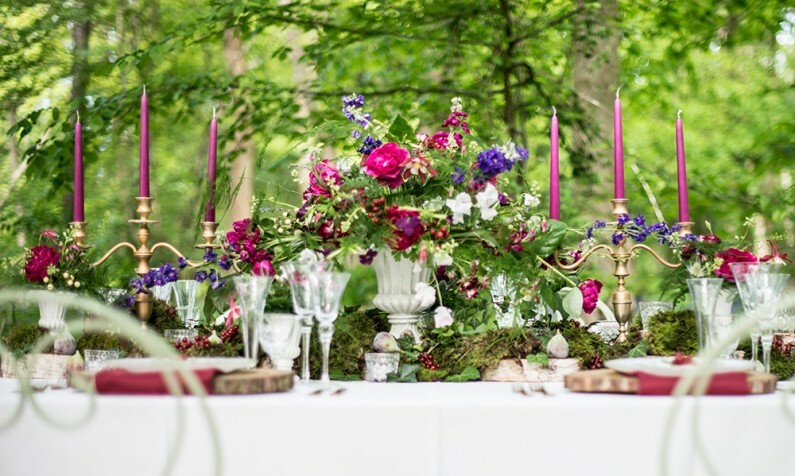 This inspirational photo shoot is the result of one such meeting as I was first introduced to wedding planner Emma of Goose & Berry Luxe at the iconic Cliveden House. 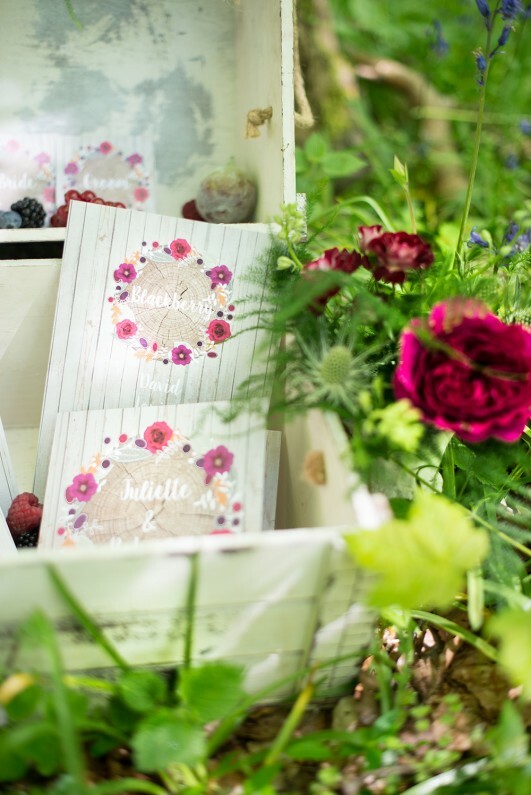 When Emma asked me to provide flowers for her Berry Luxe styled shoot, I absolutely couldn’t refuse. 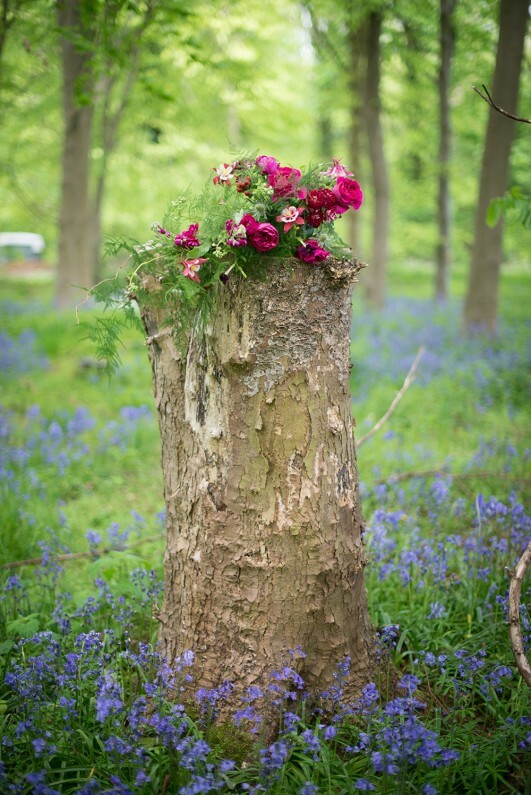 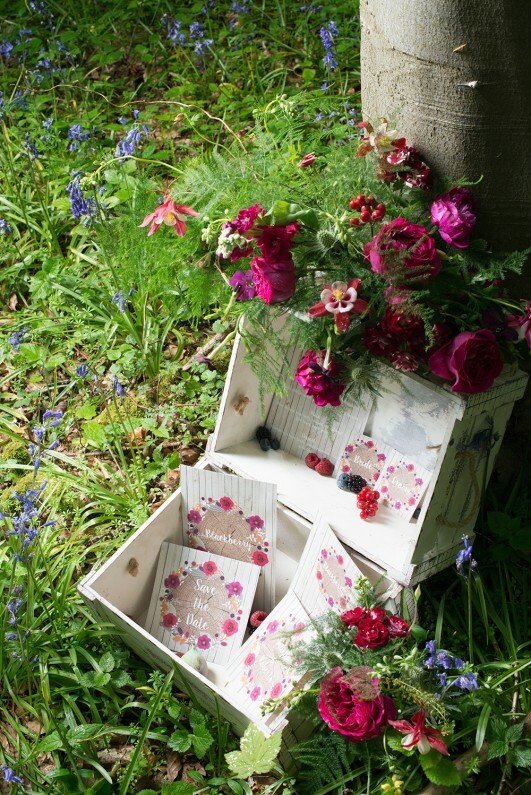 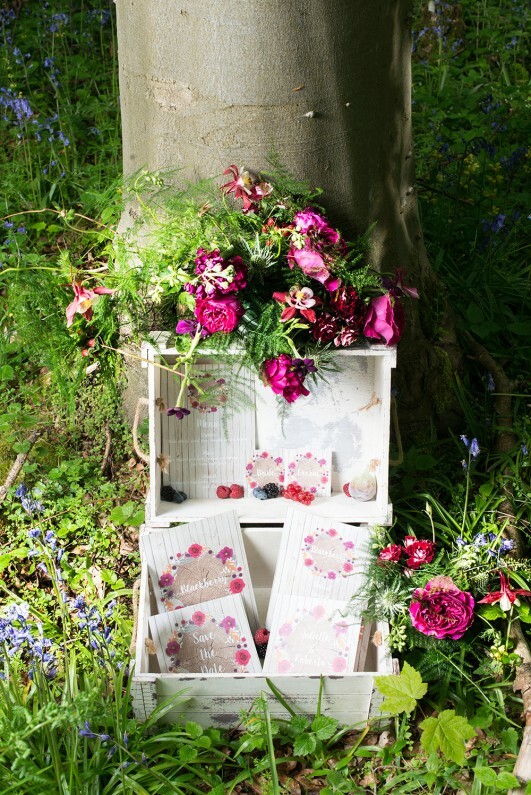 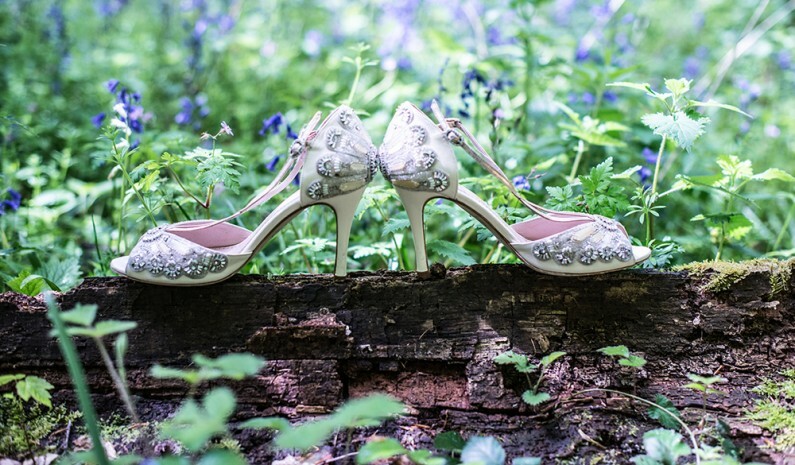 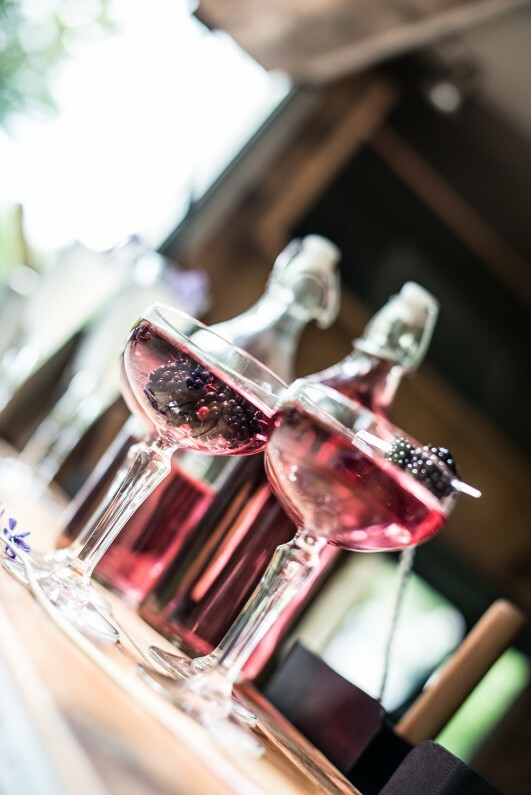 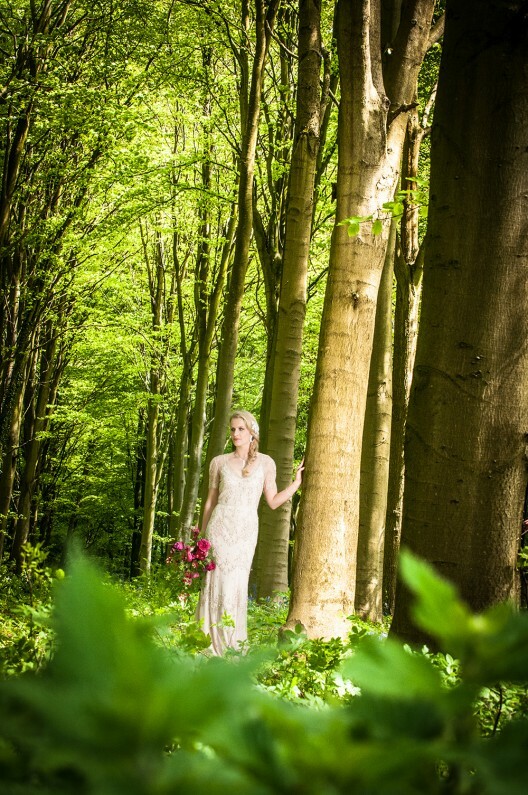 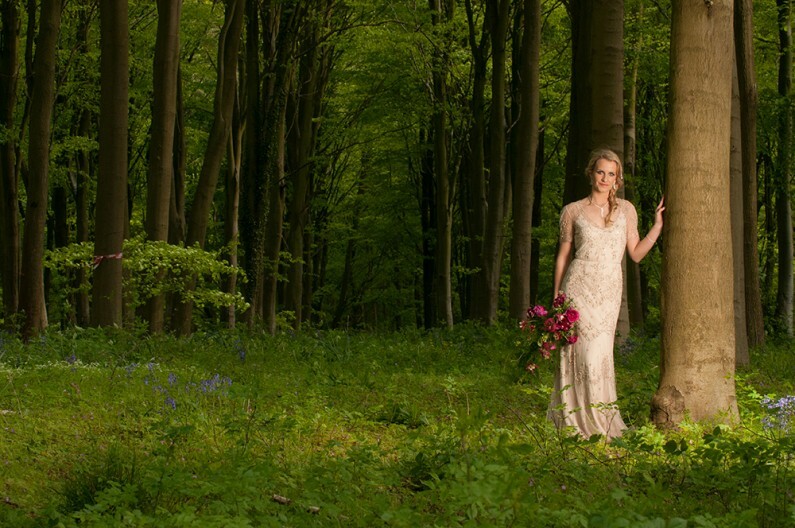 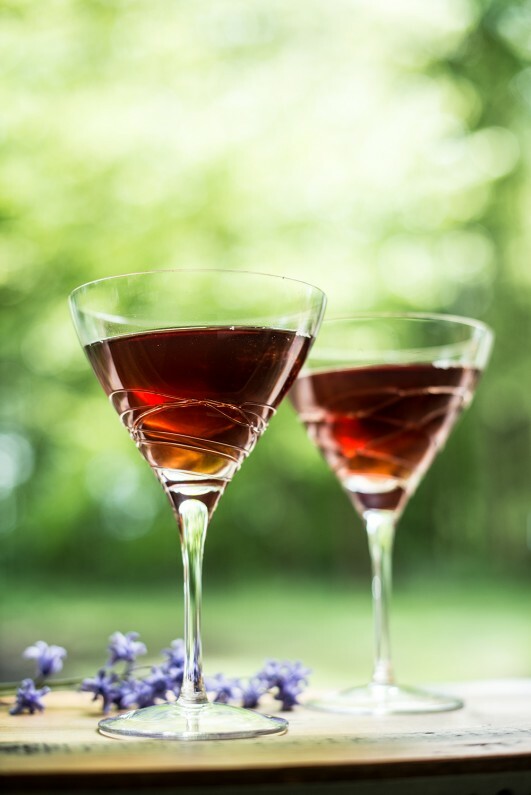 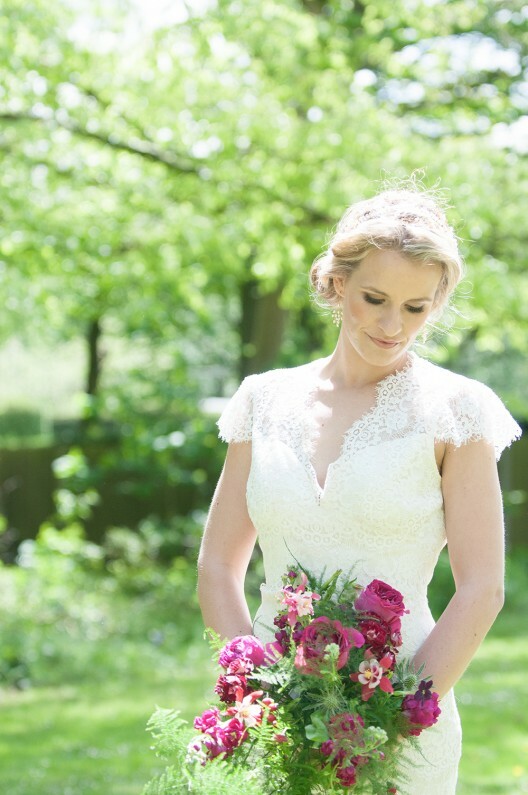 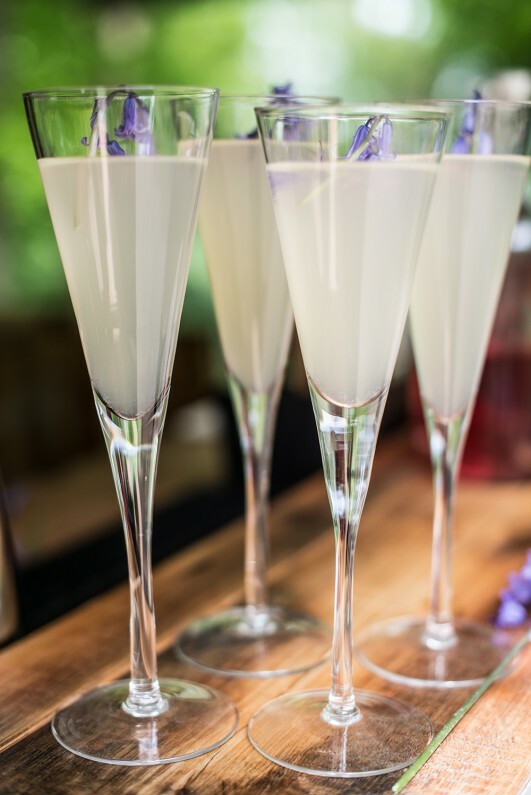 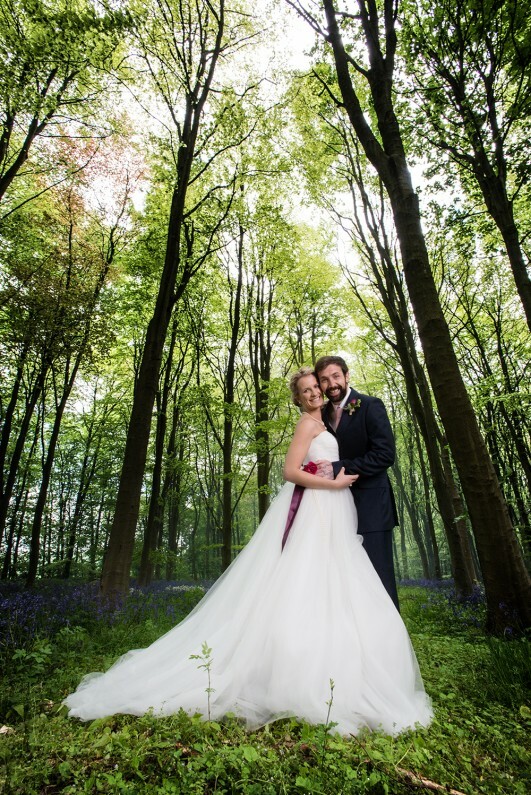 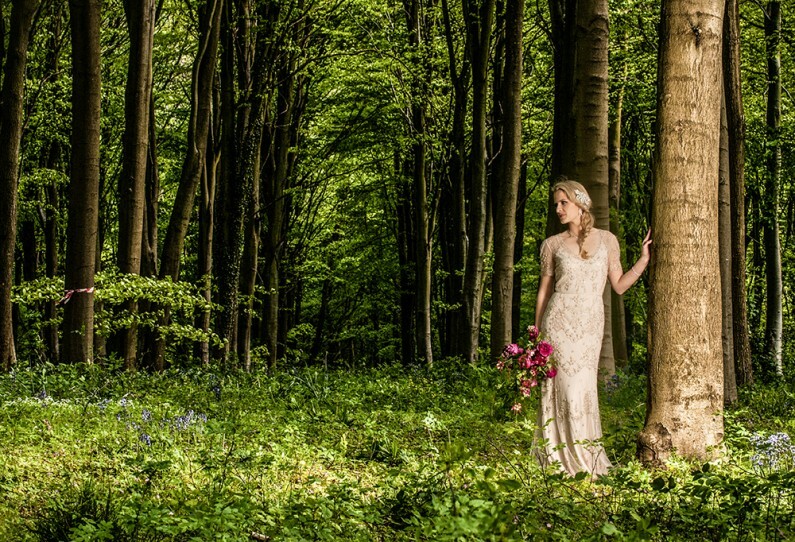 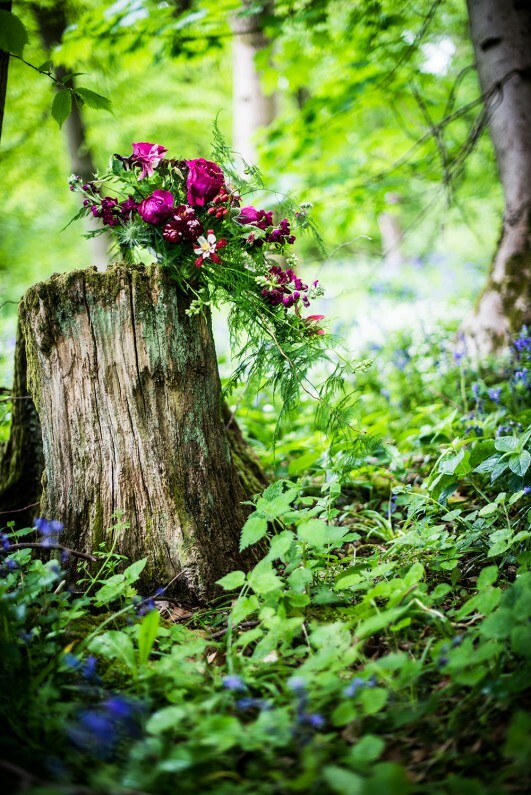 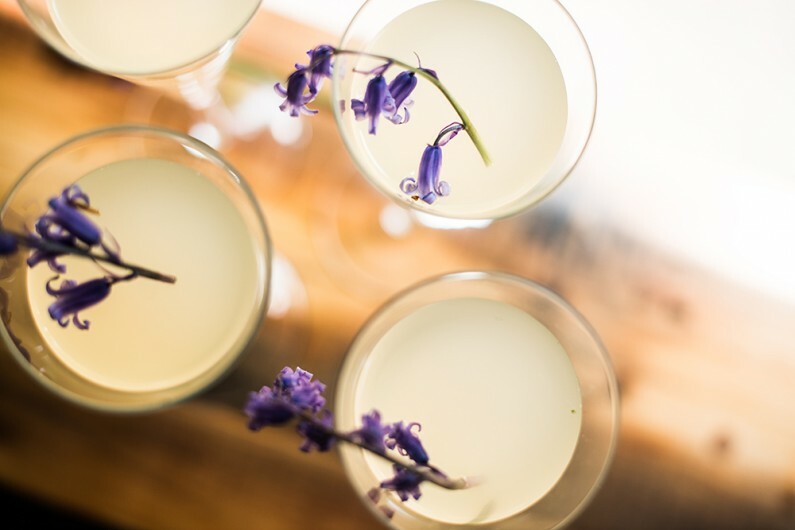 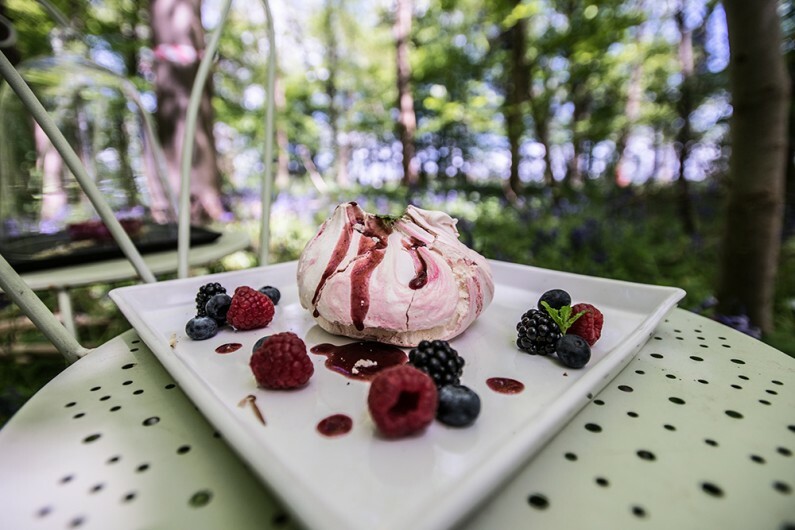 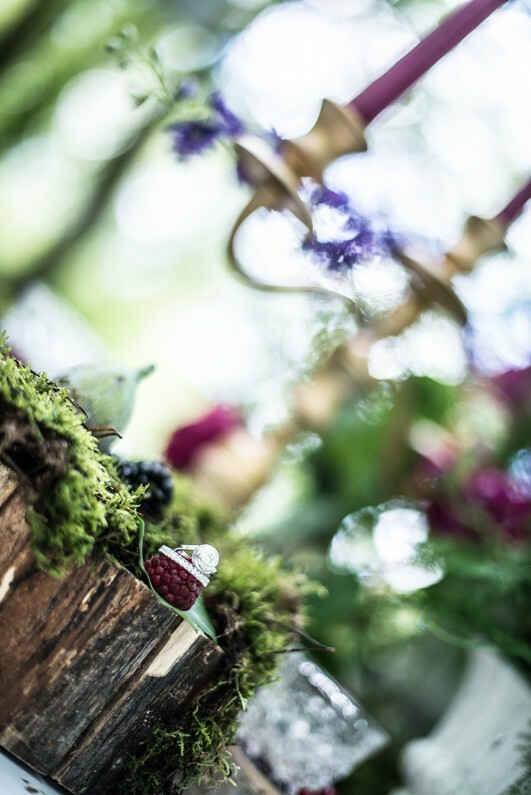 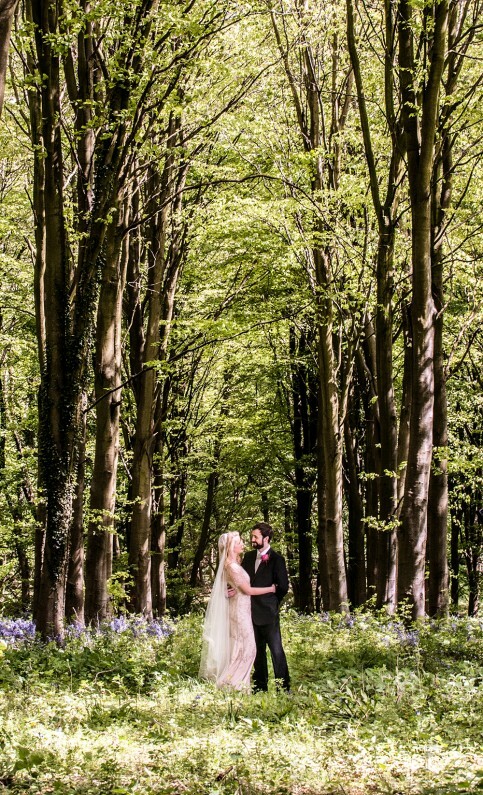 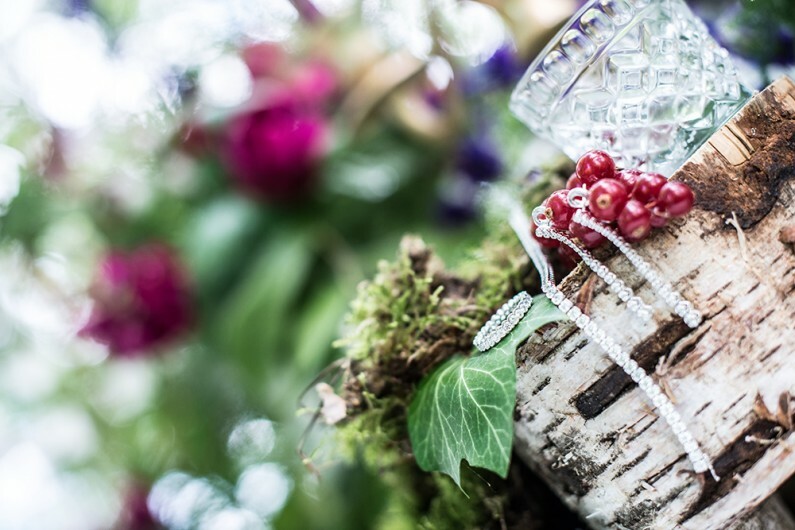 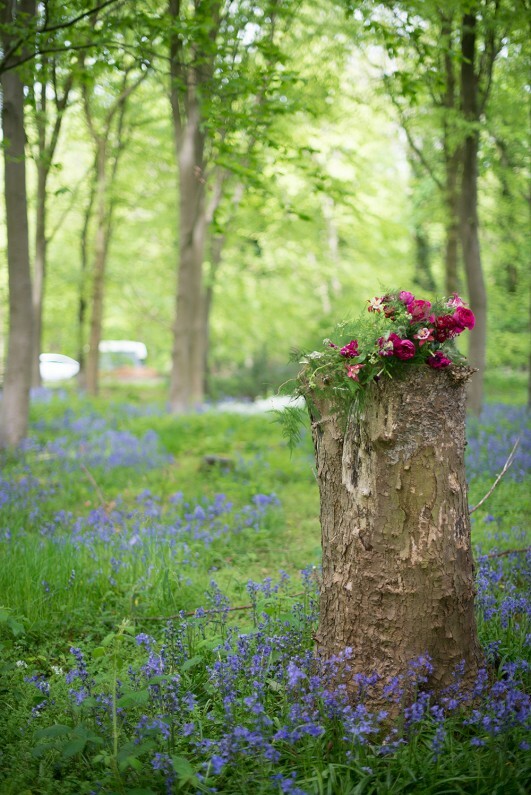 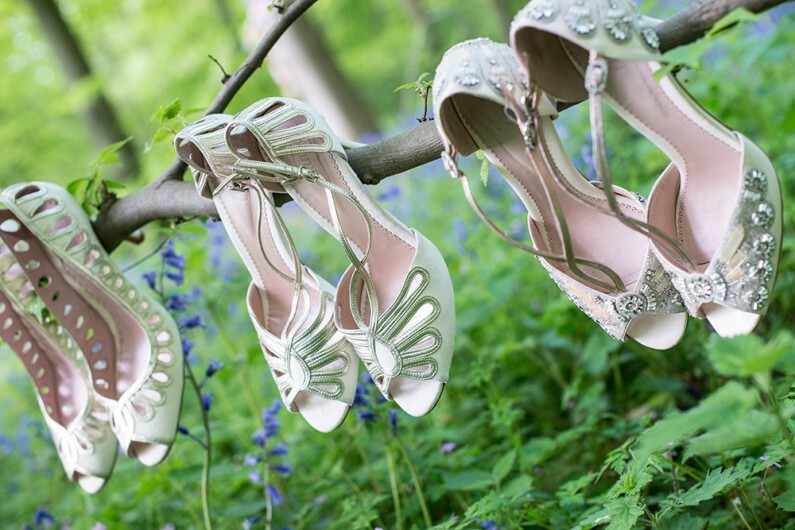 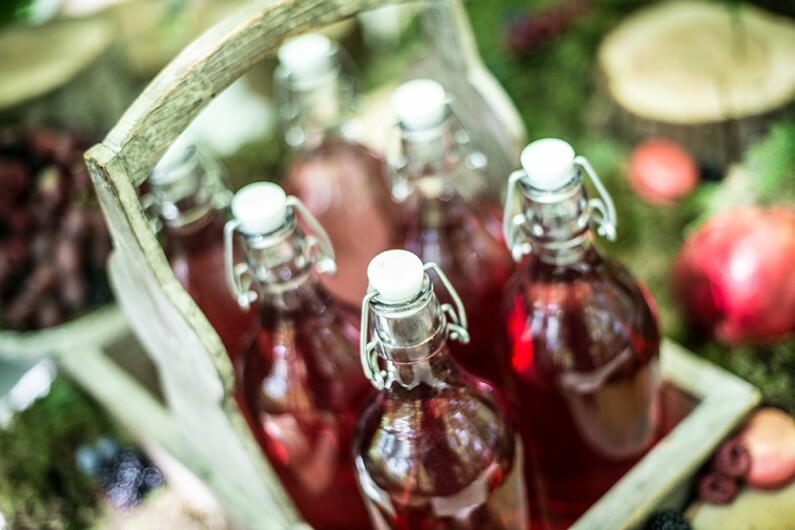 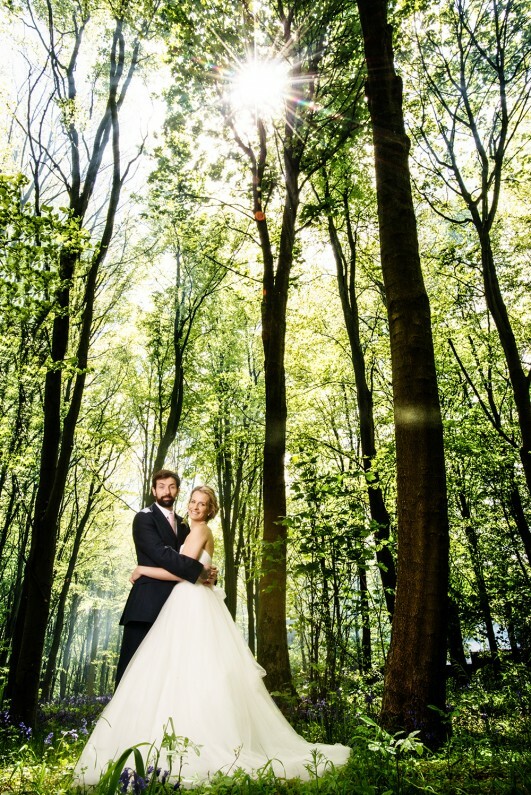 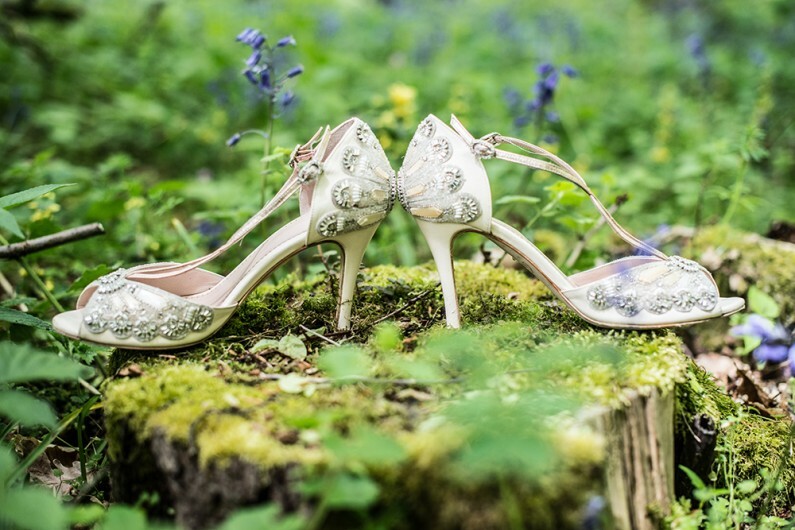 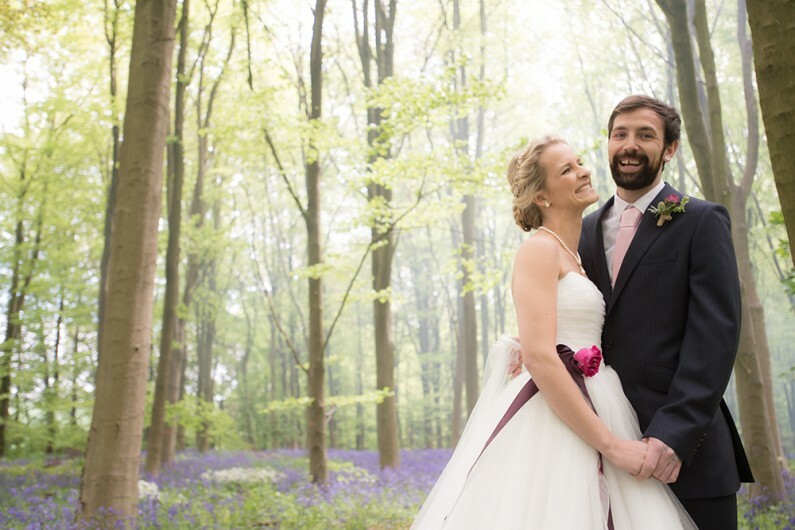 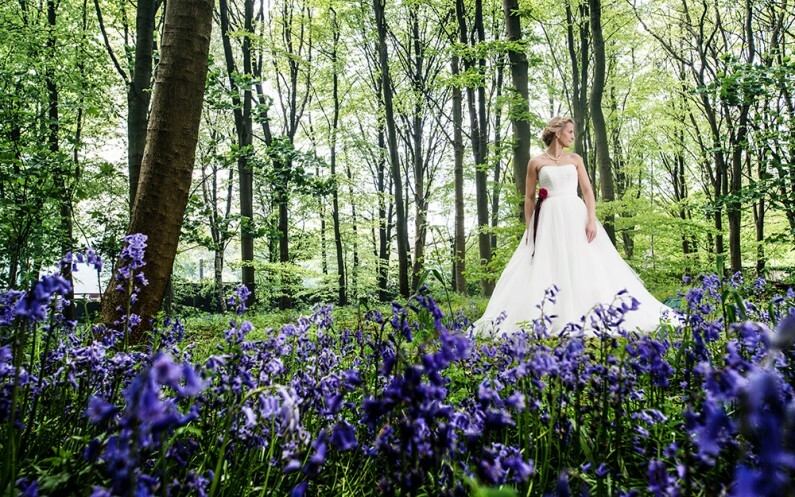 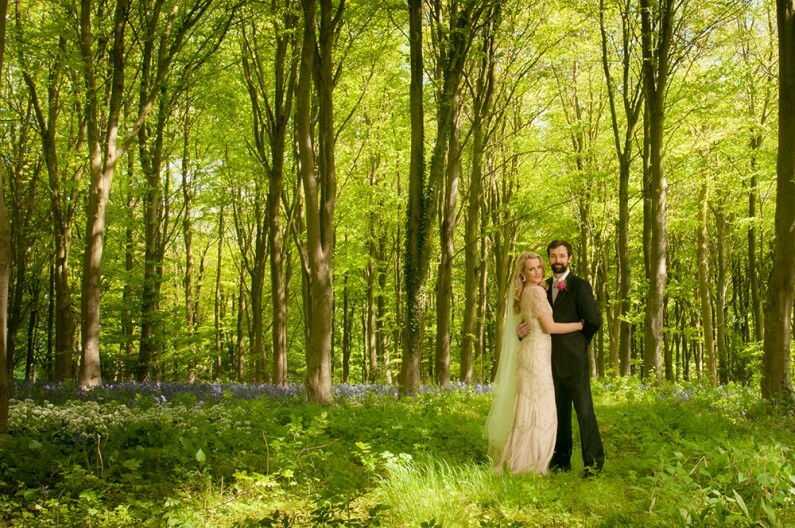 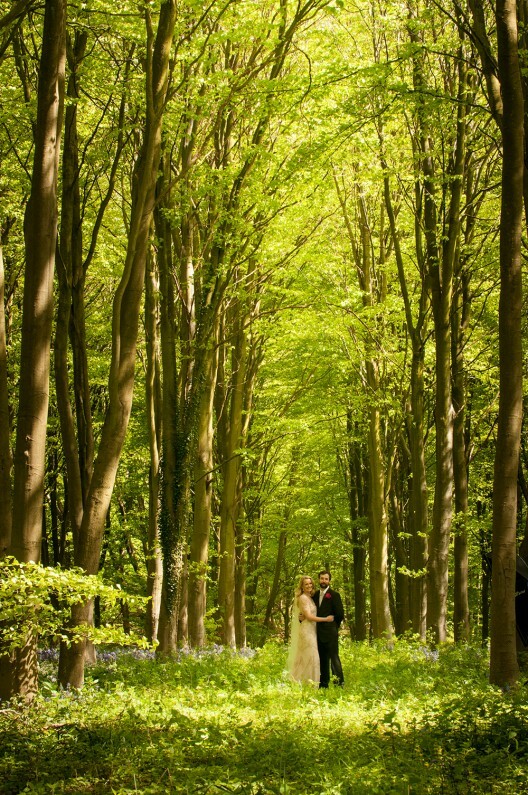 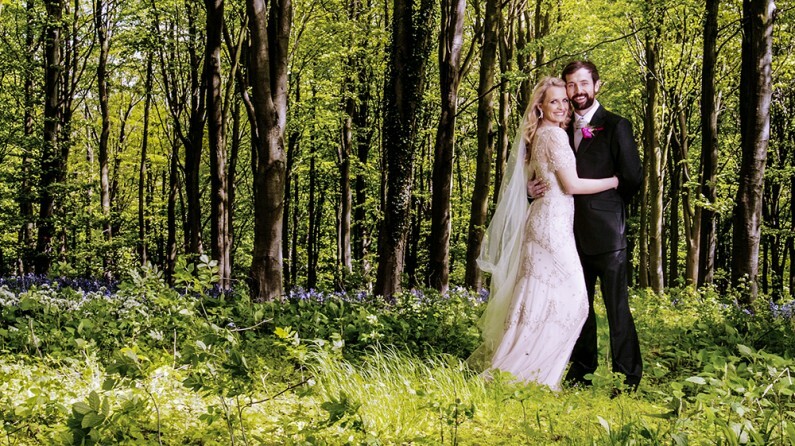 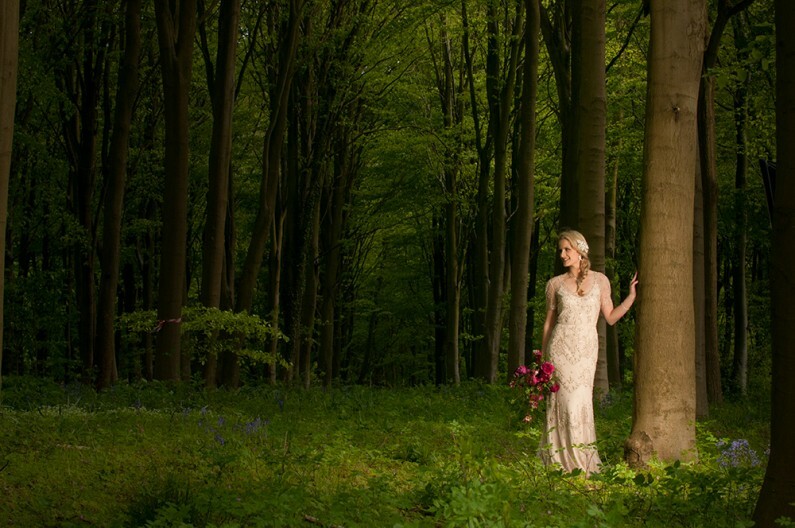 Our location, a beautiful bluebell wood near Great Missenden in Buckinghamshire, was focused around one word – berry. 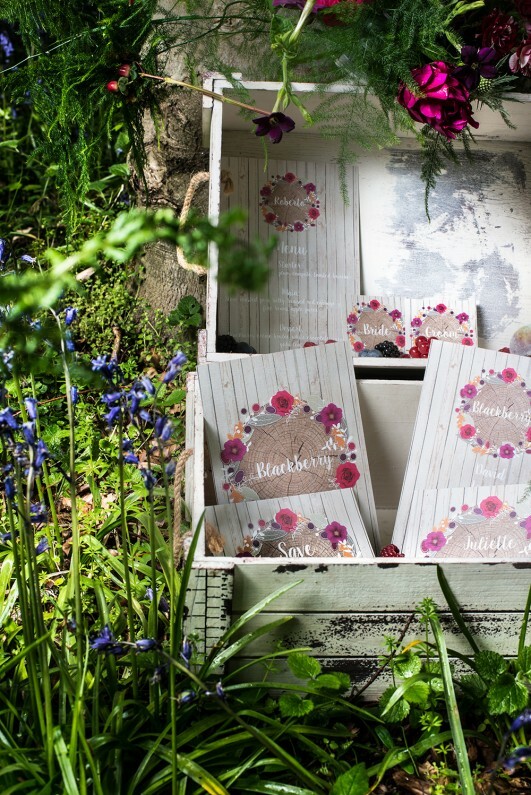 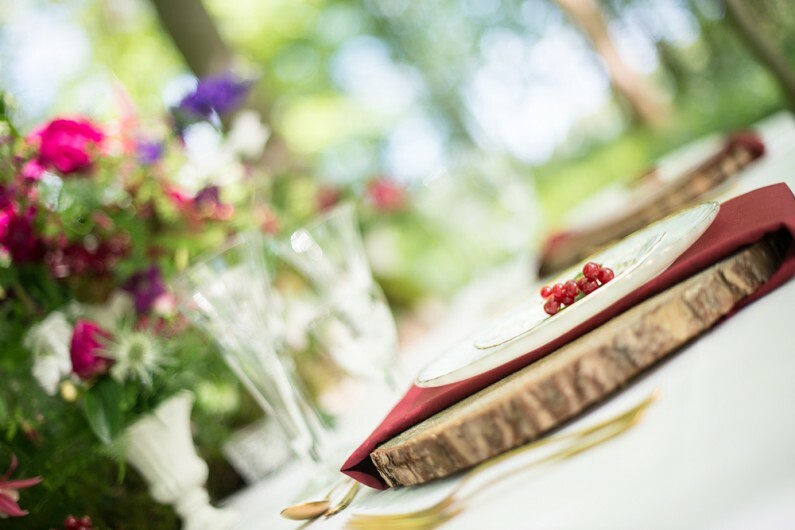 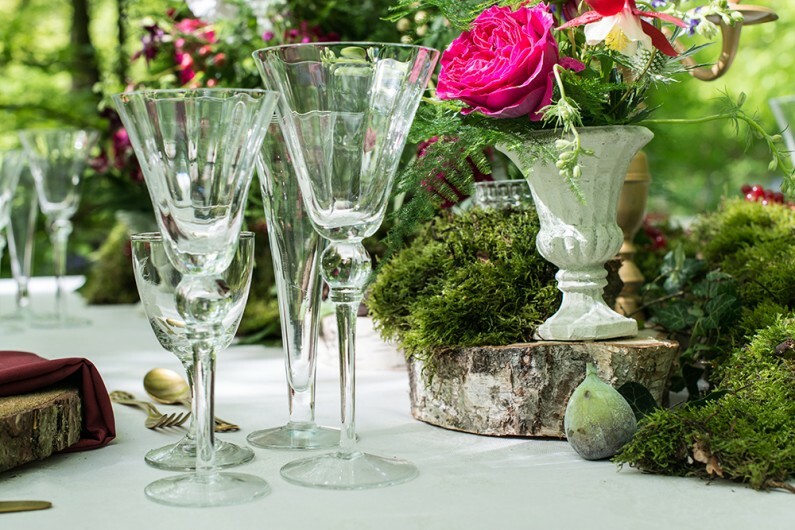 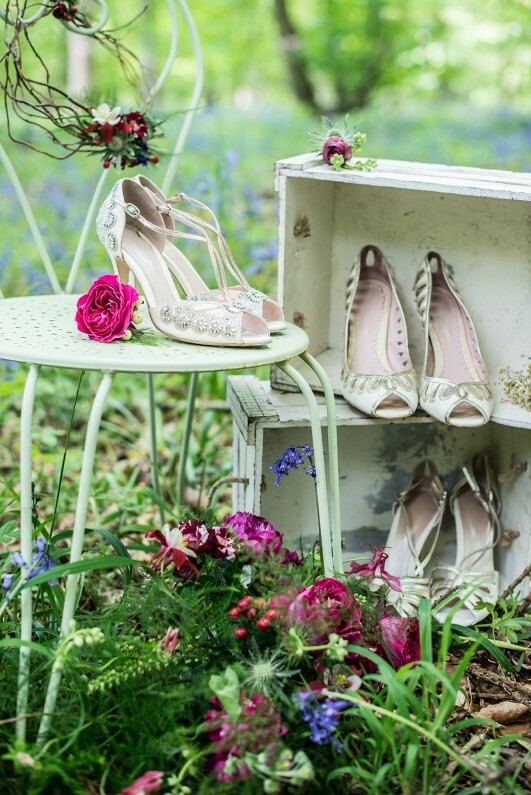 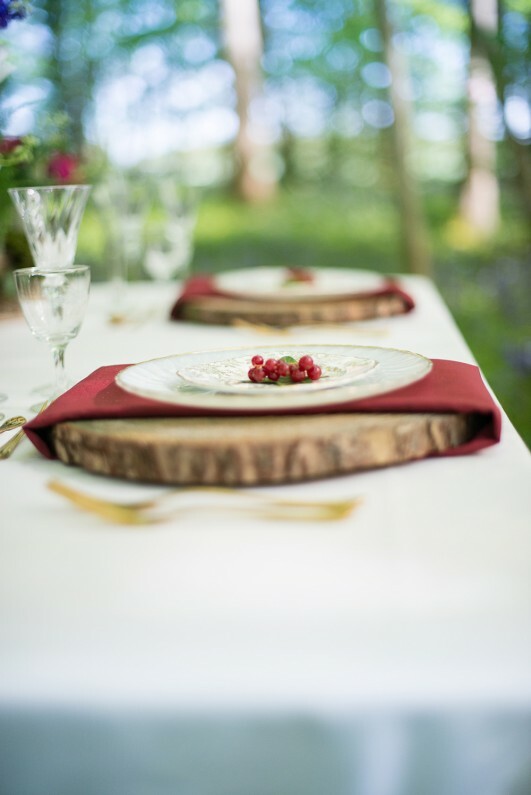 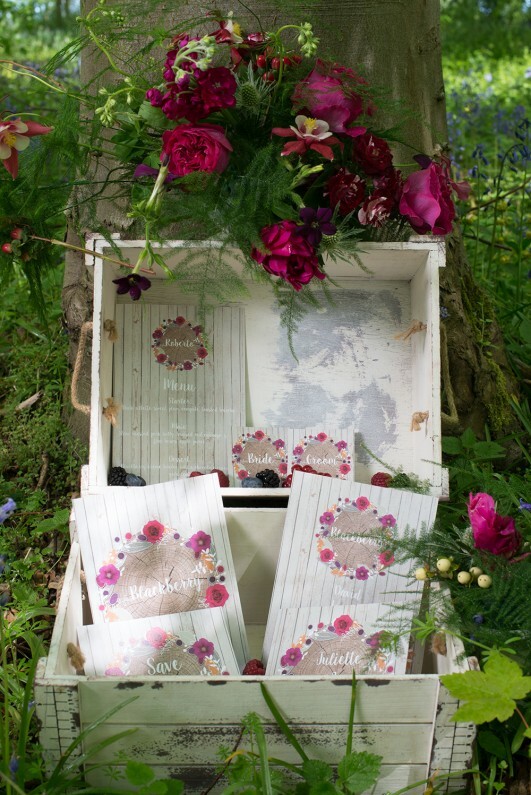 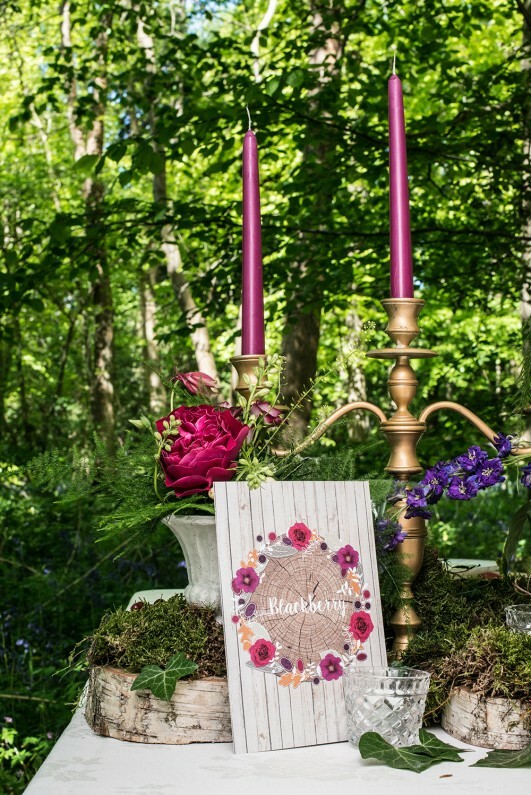 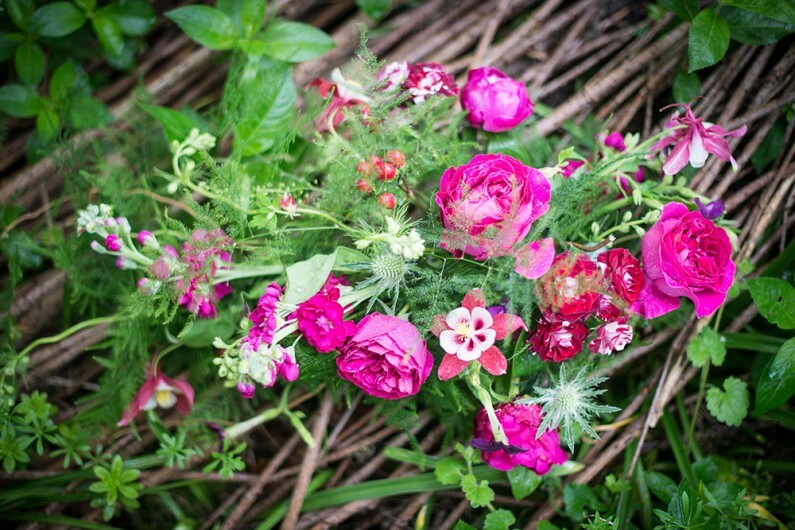 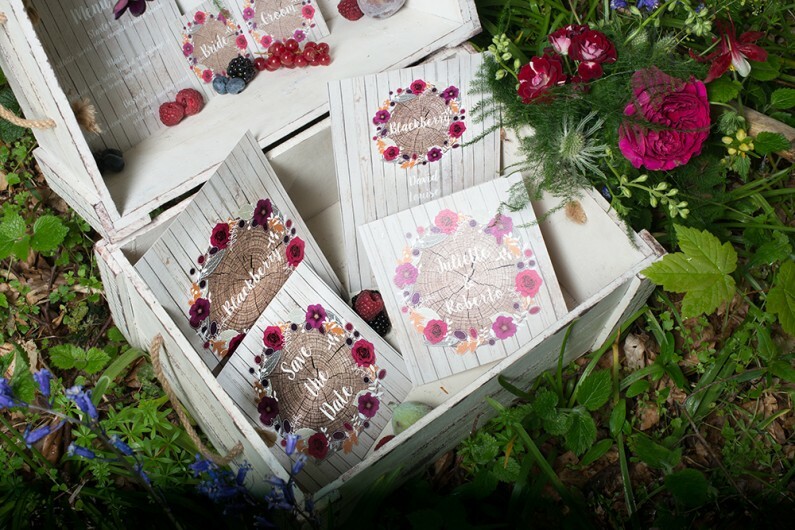 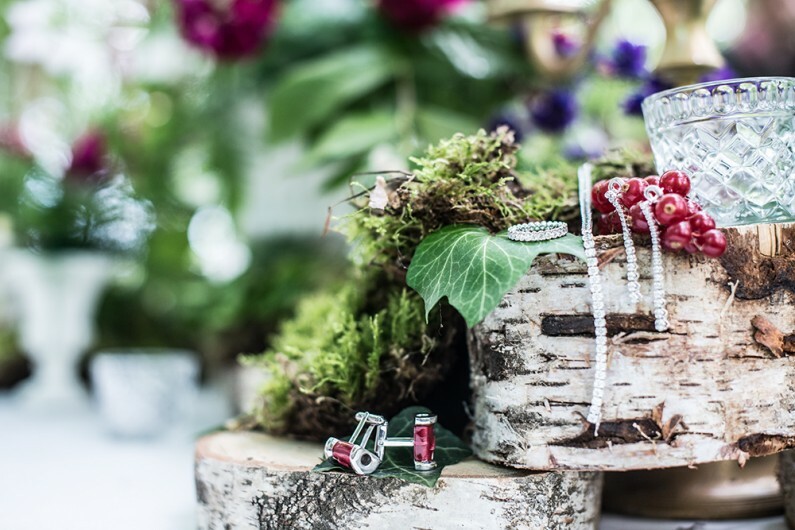 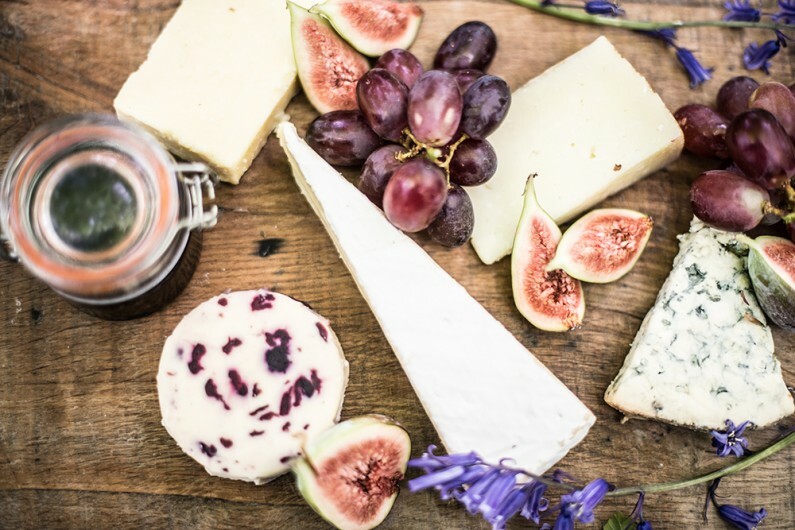 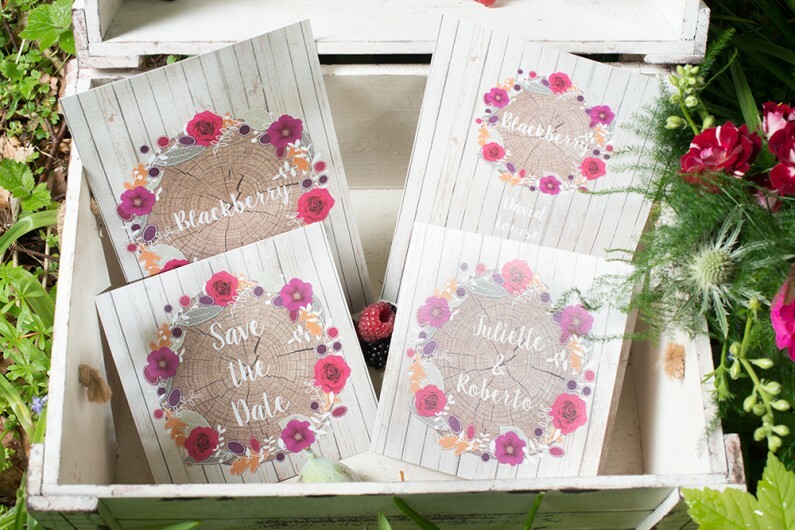 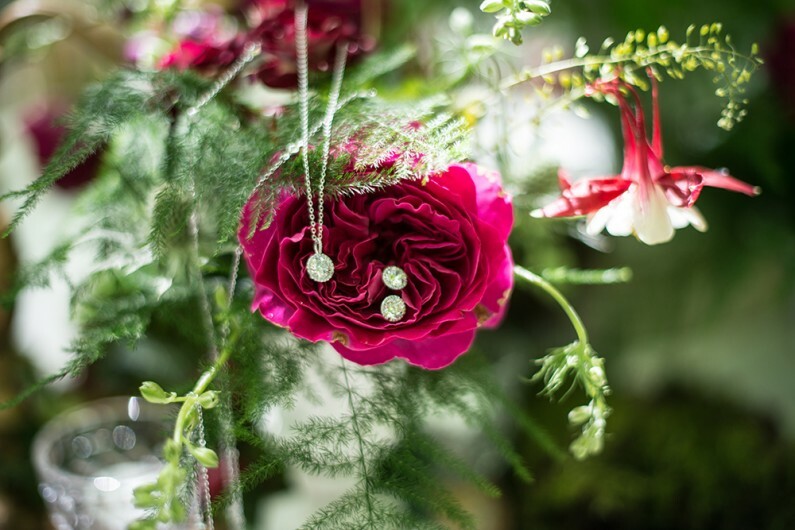 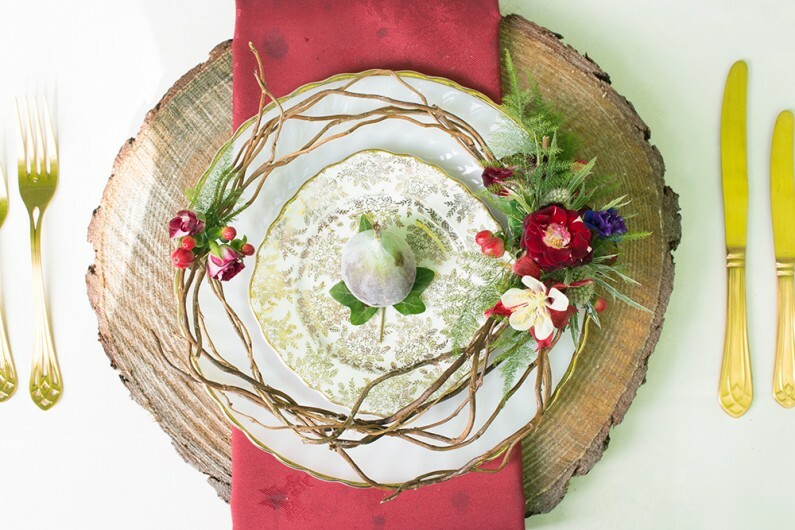 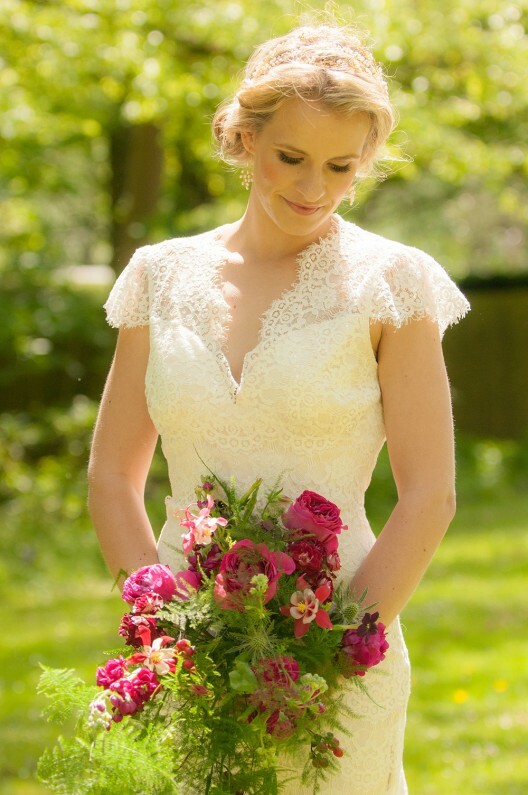 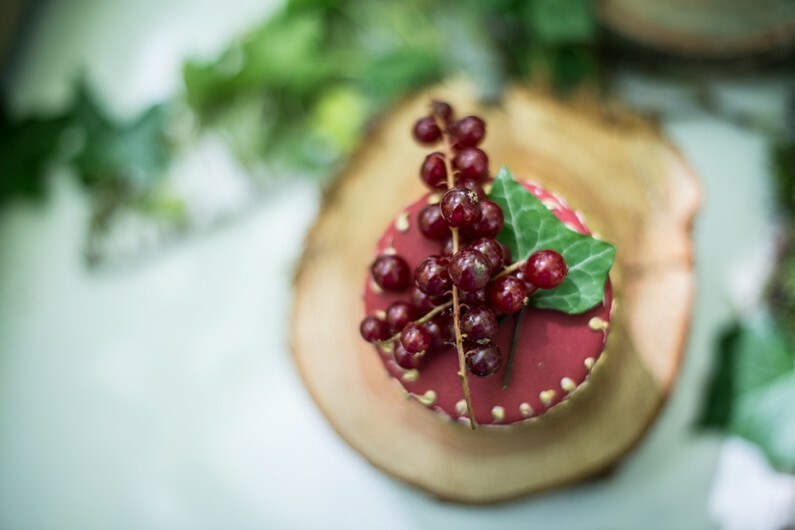 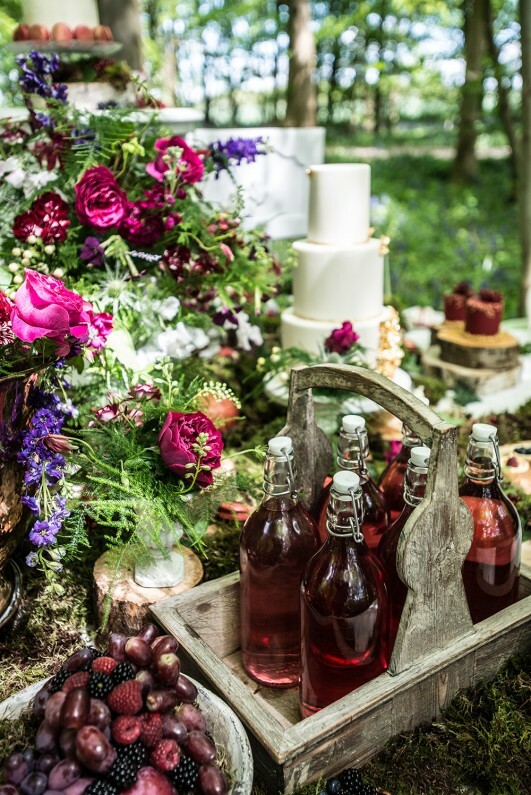 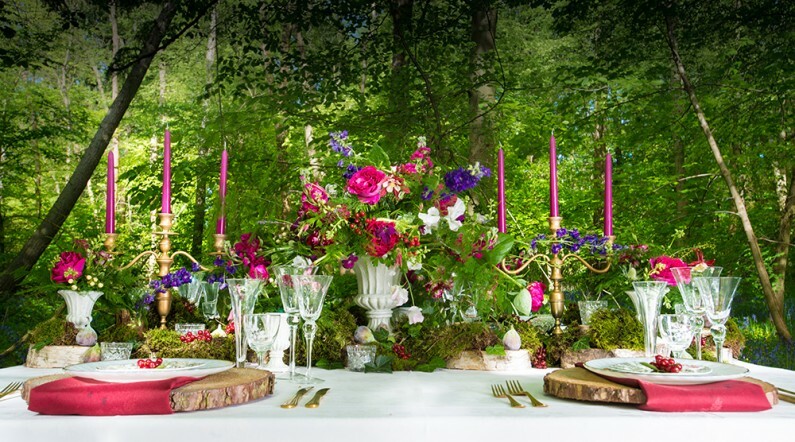 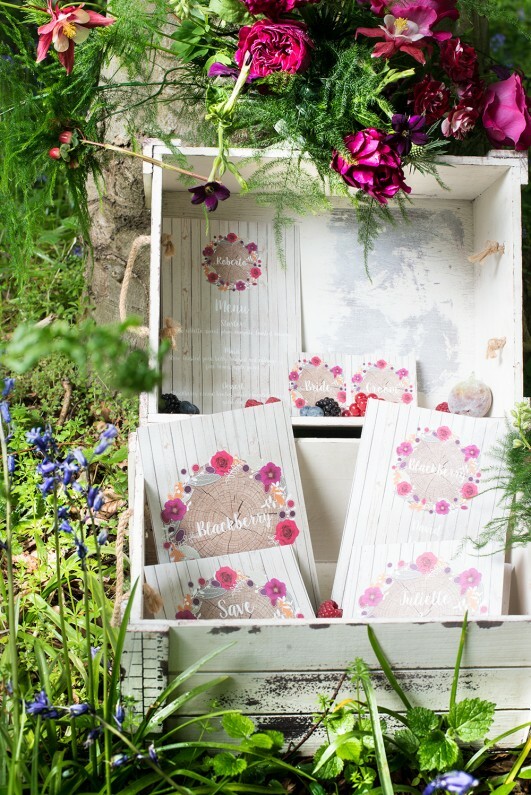 This was the basis for everything from the colour palette to the flowers and, as Goose & Berry are also fabulous caterers, the food that featured in the shoot was a definite highlight! 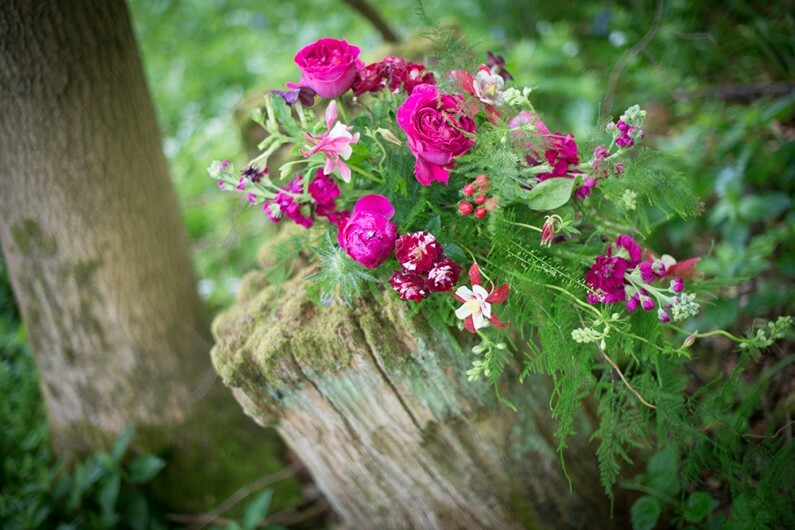 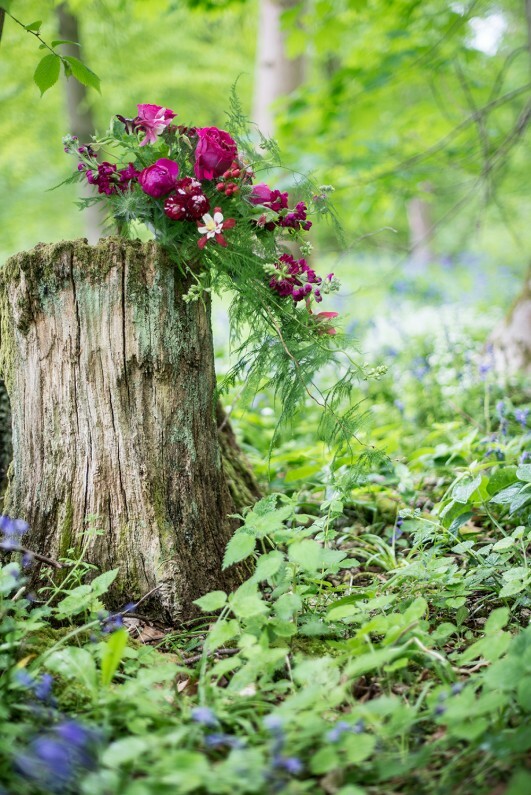 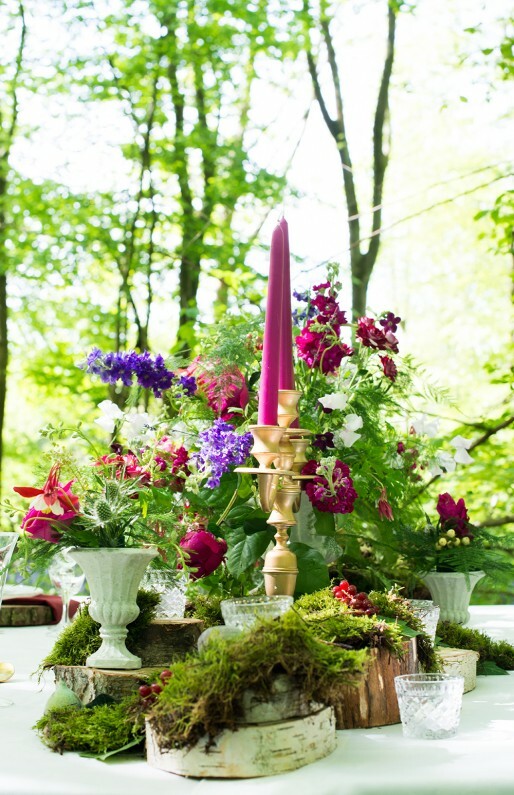 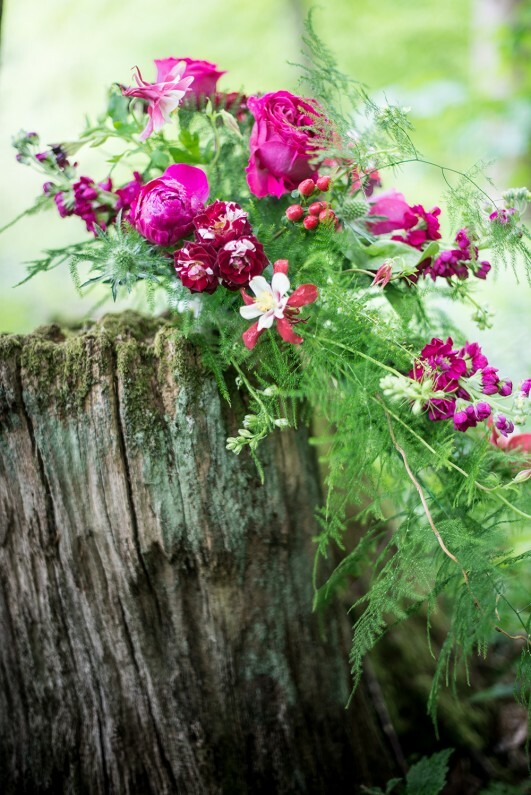 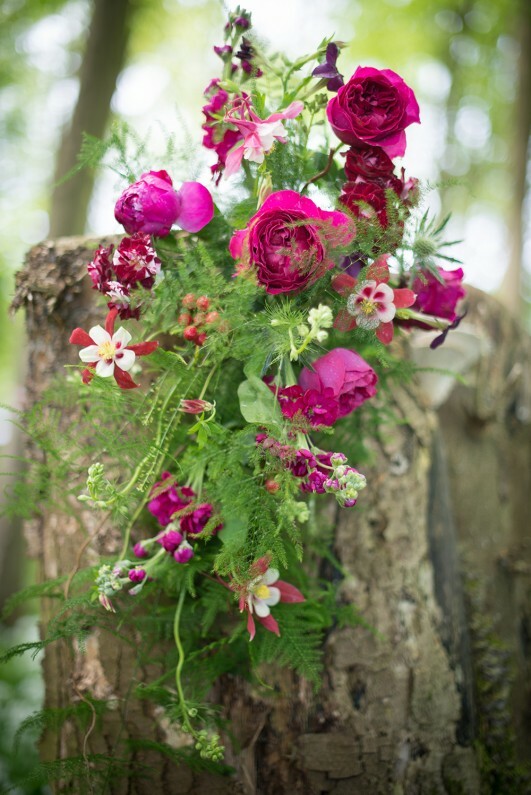 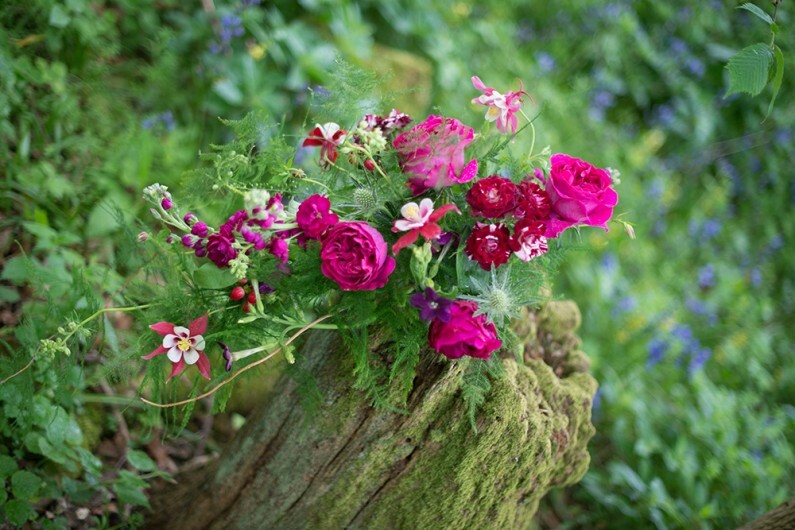 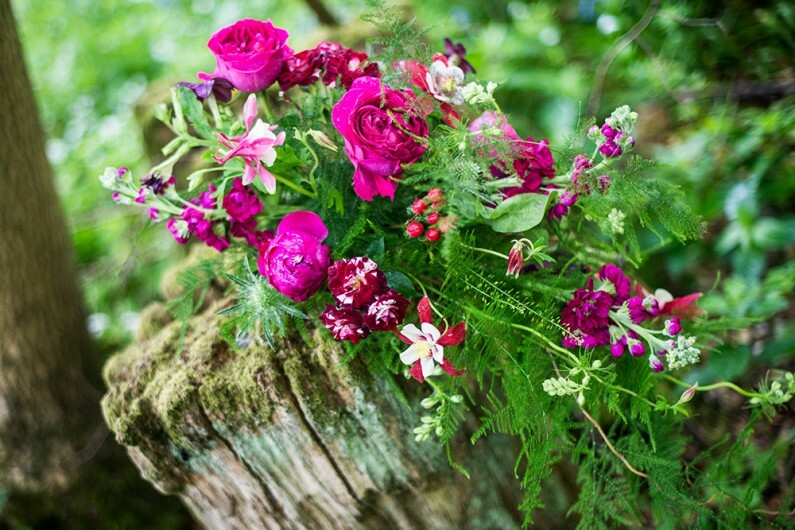 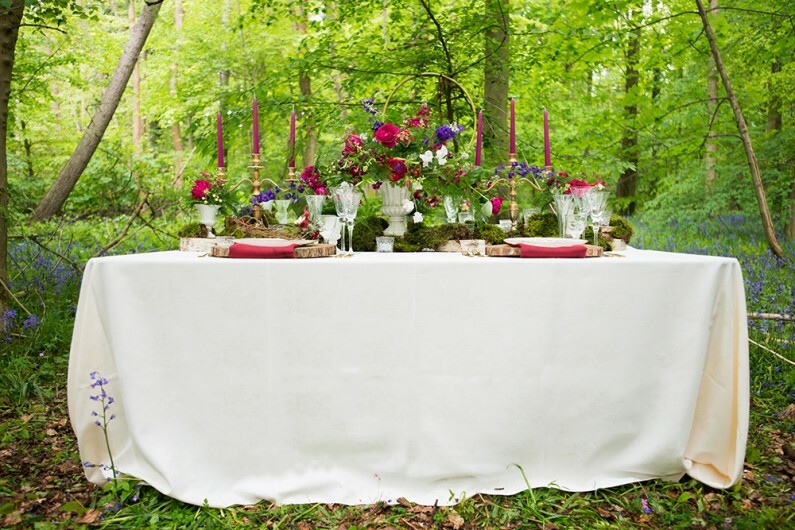 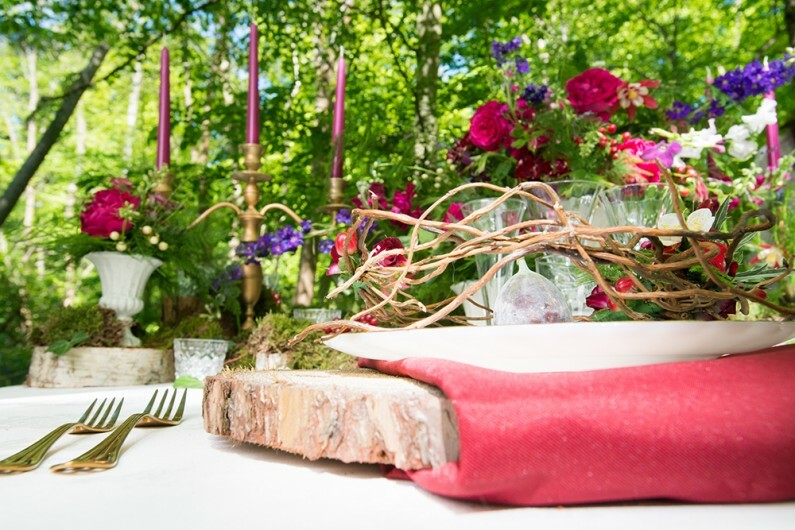 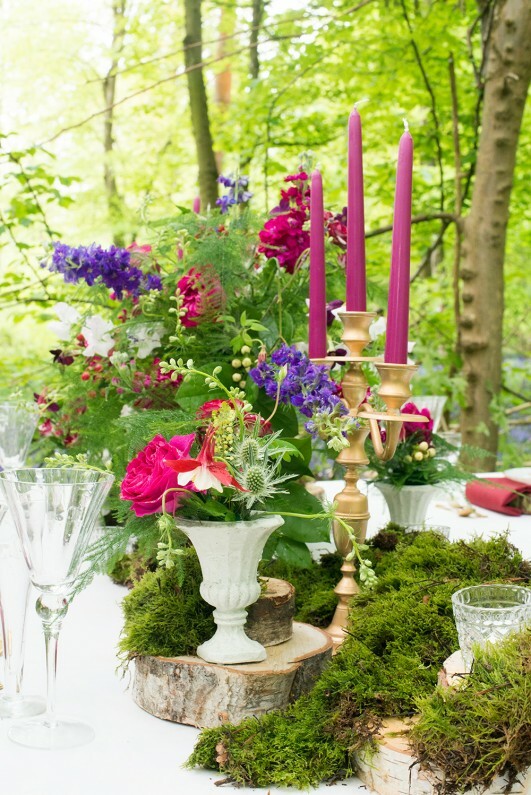 I used logs and moss as the basis for my arrangements, not only because they suited the woodland location but also because they brought so much texture to the table. 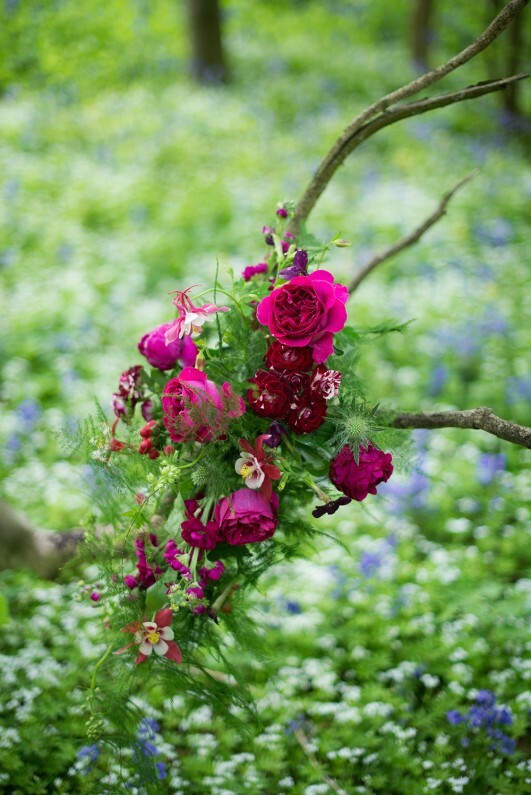 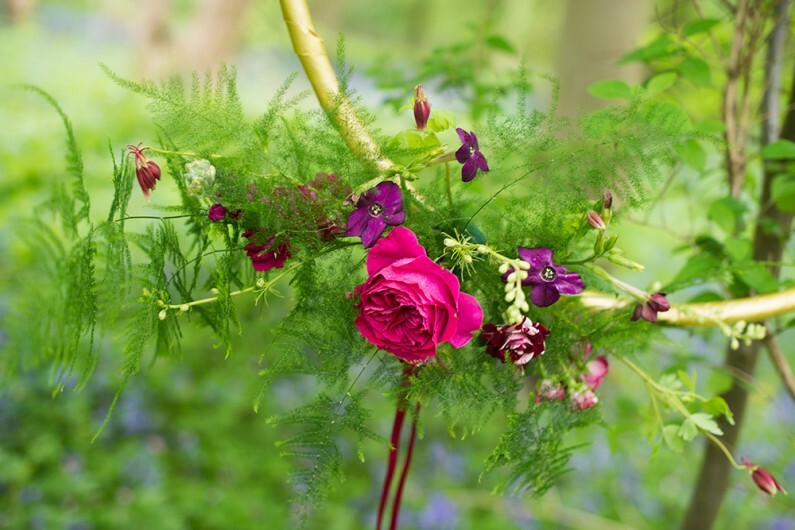 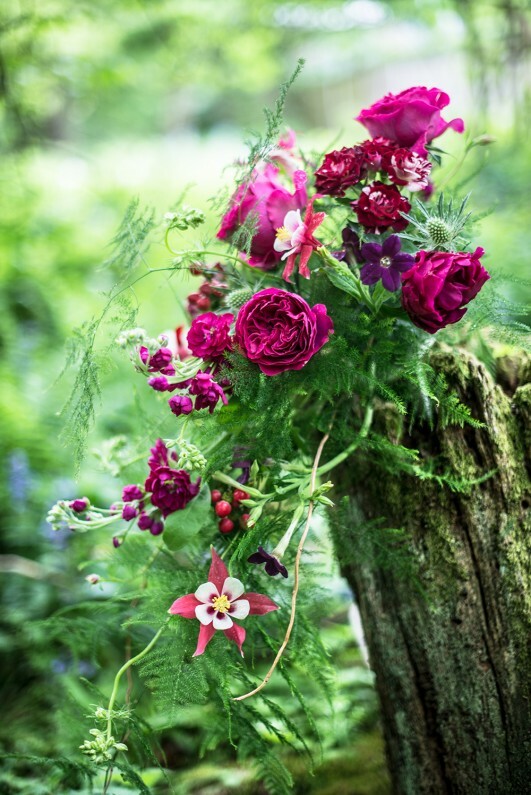 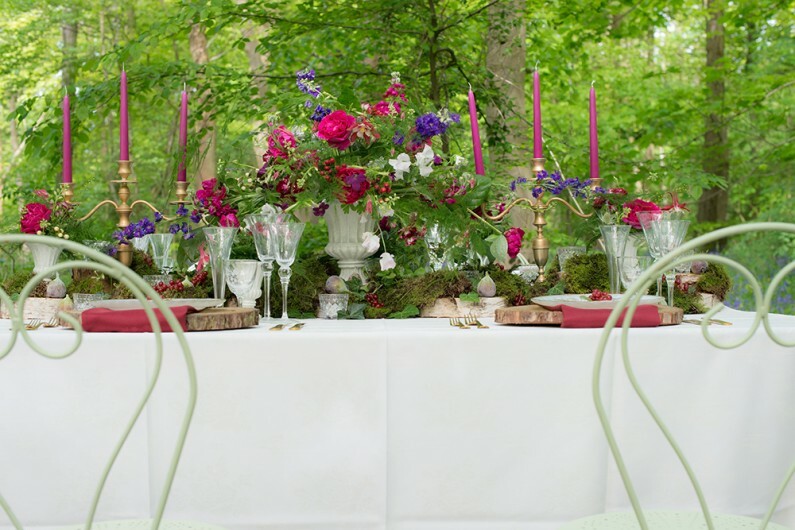 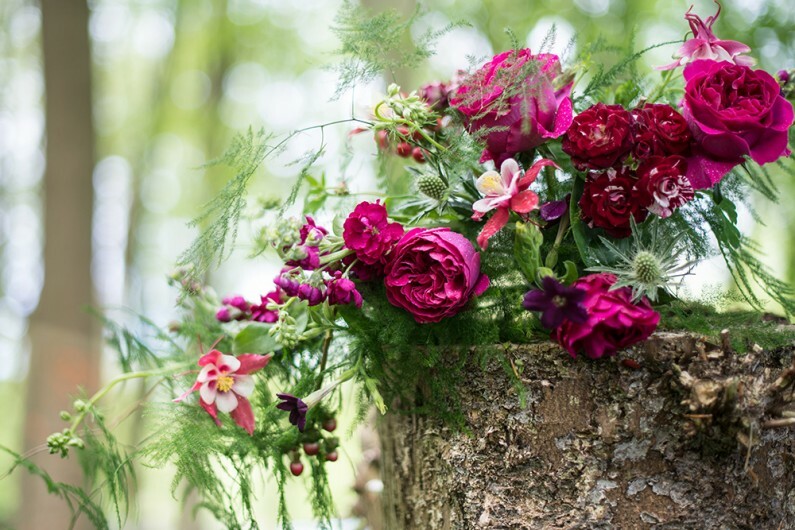 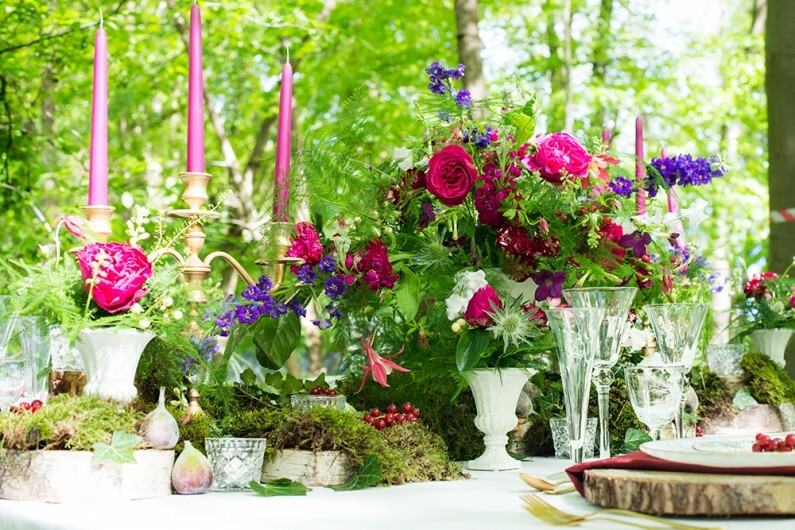 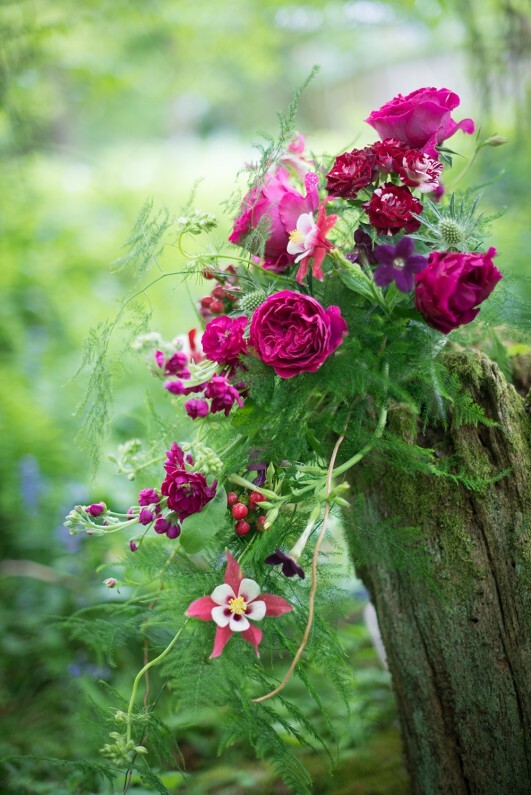 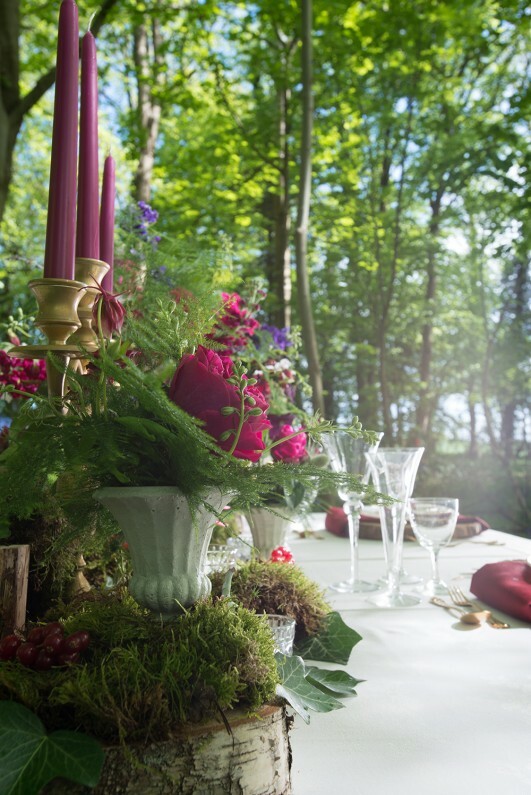 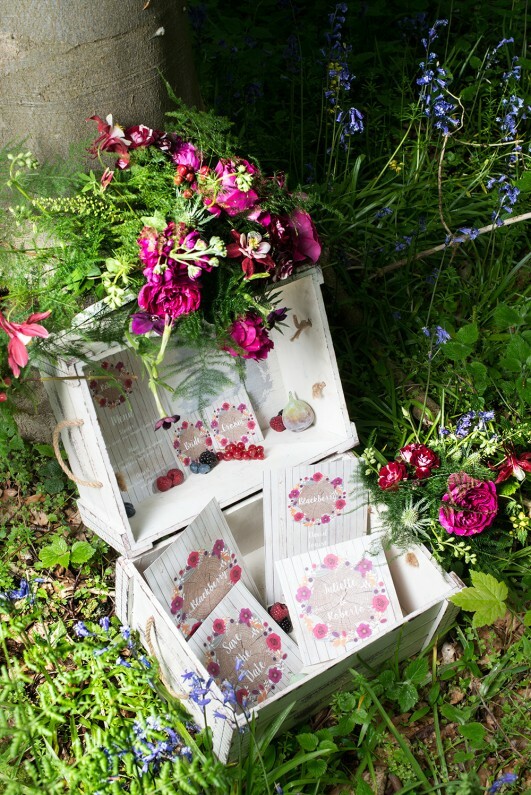 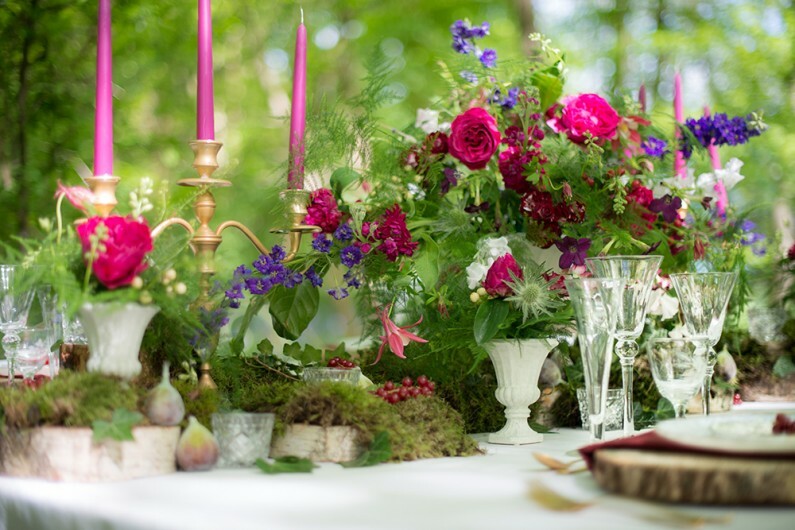 Flowers in rich berry tones from the deep raspberry David Austin roses through to the blooms in purple and red hues all tied in perfectly with the tempting berry juices and mouthwatering food. 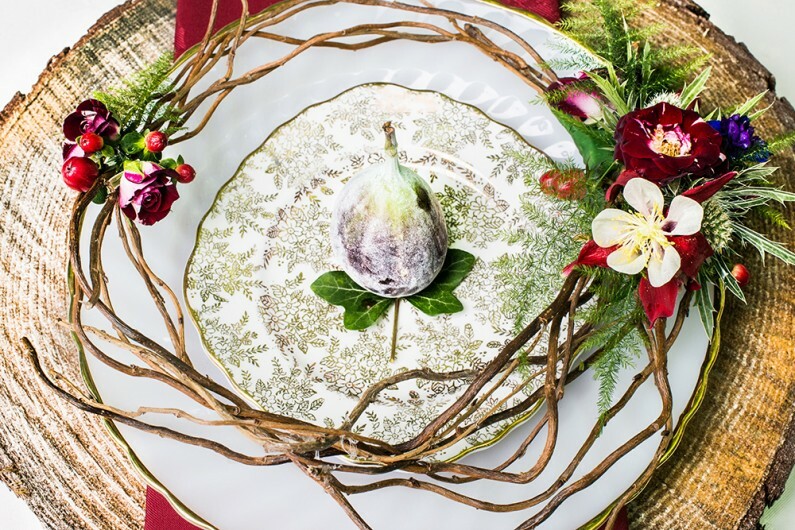 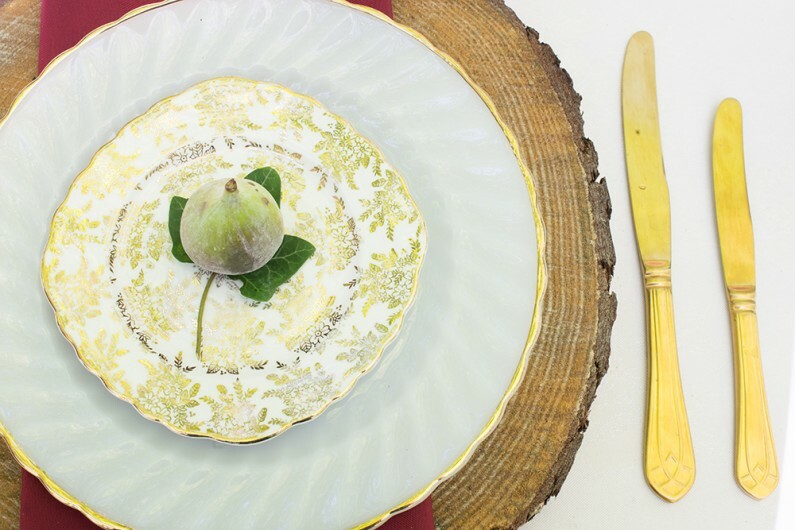 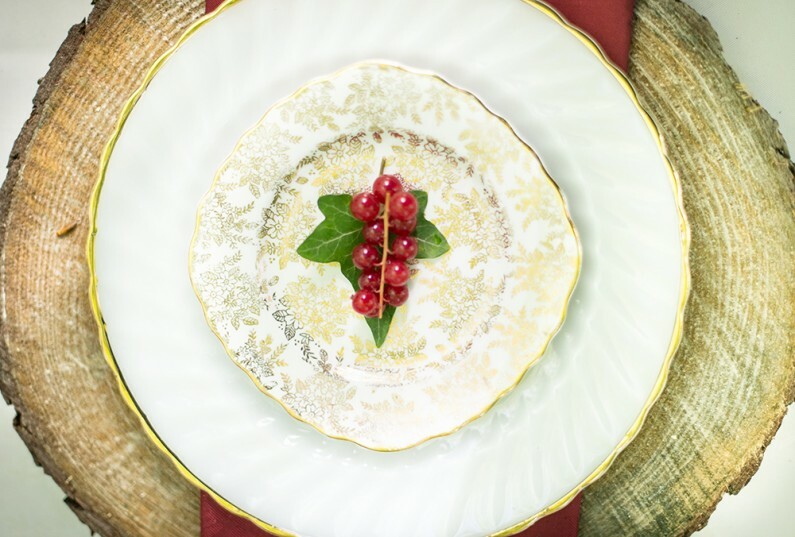 I added redcurrants, figs and grapes to the feast as decorative touches and a splash of gold added more than a hint of luxury. 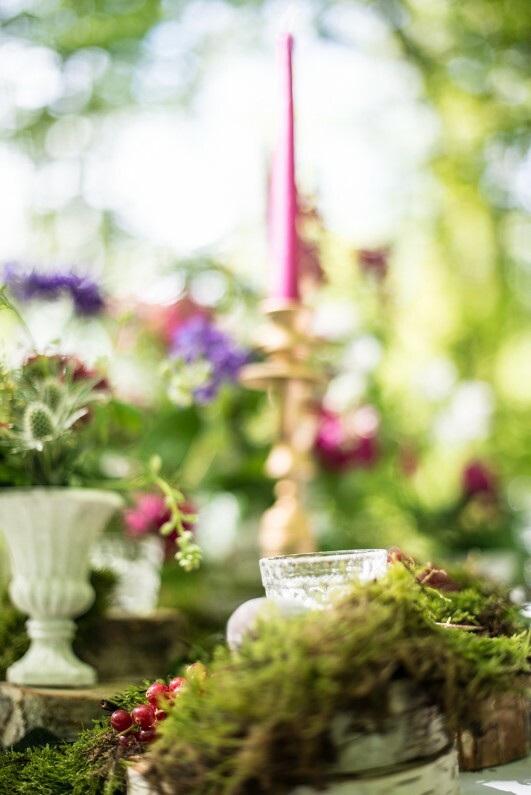 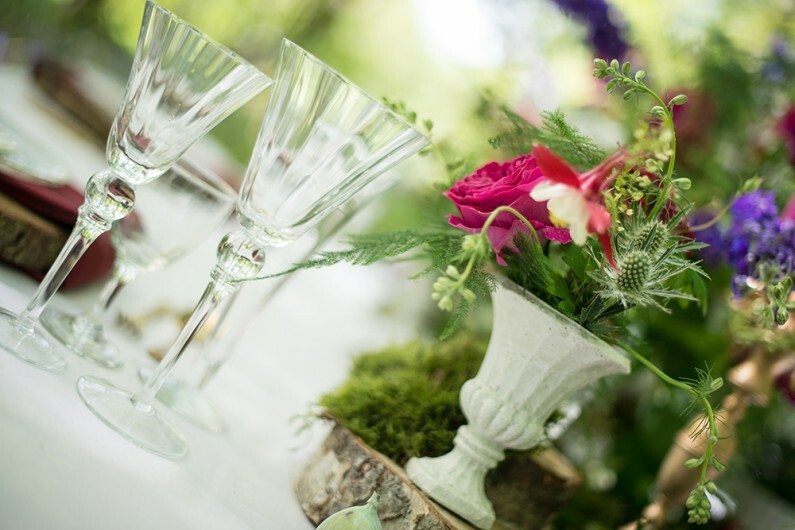 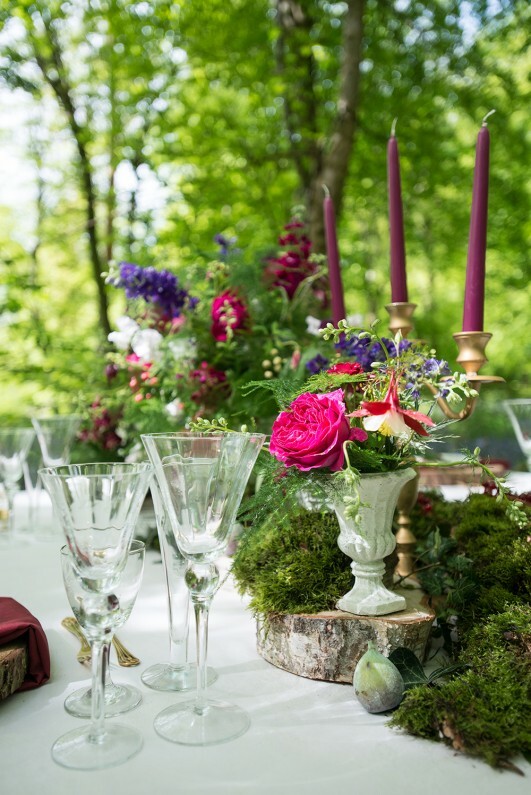 The stone urn that was the table’s centerpiece was full with more flowers and greenery and mini runs were also used as candleholders. 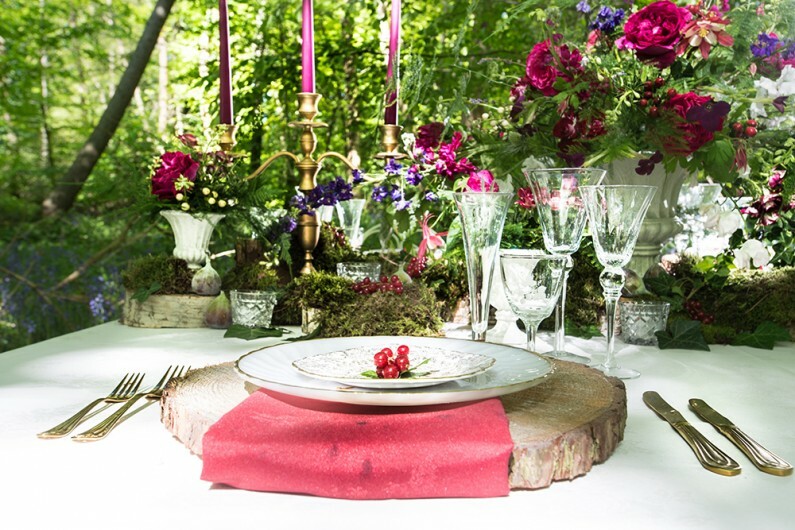 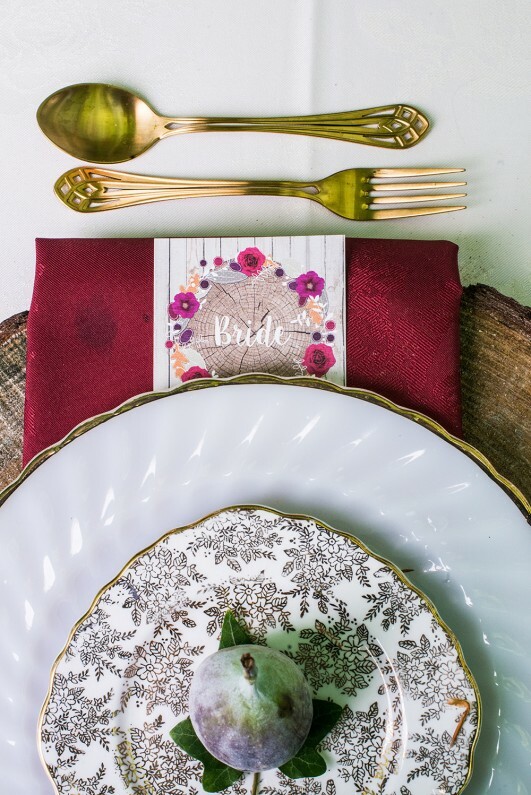 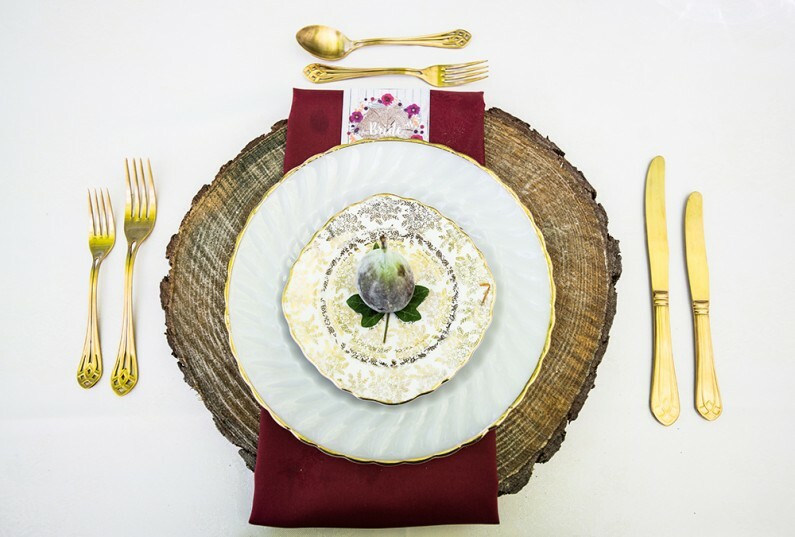 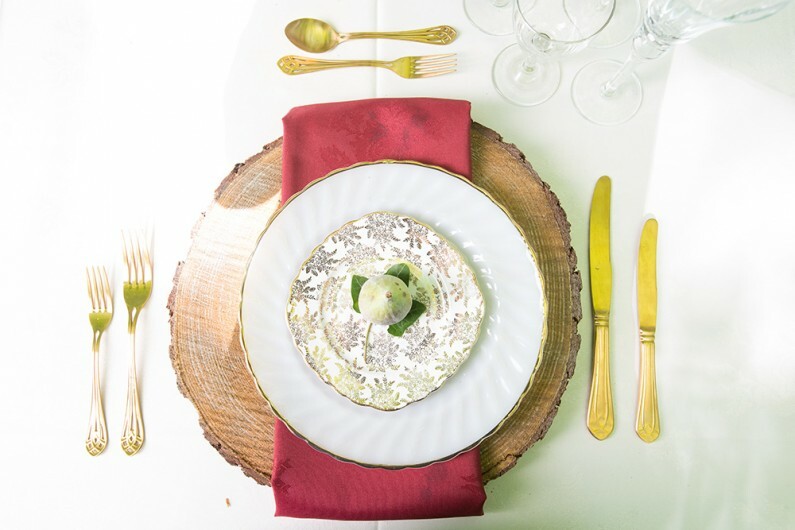 Vintage glasses, chargers made from wooden discs, berry coloured napkins and china with golden embellishments finished a heavenly table. 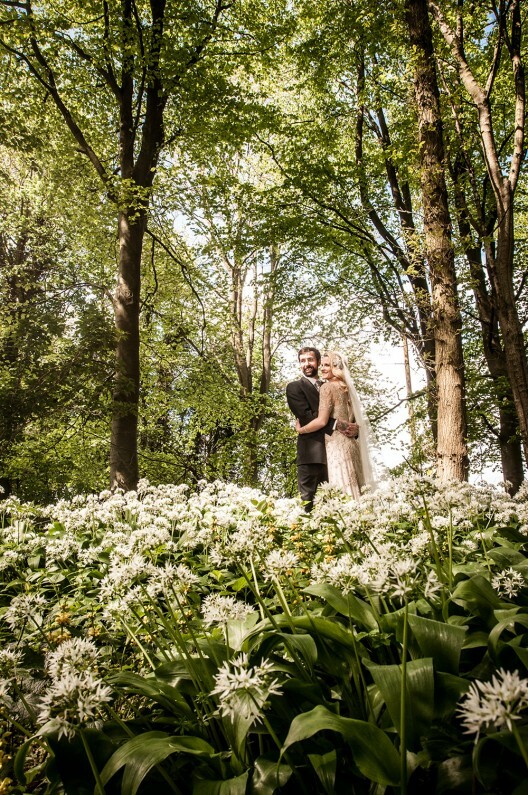 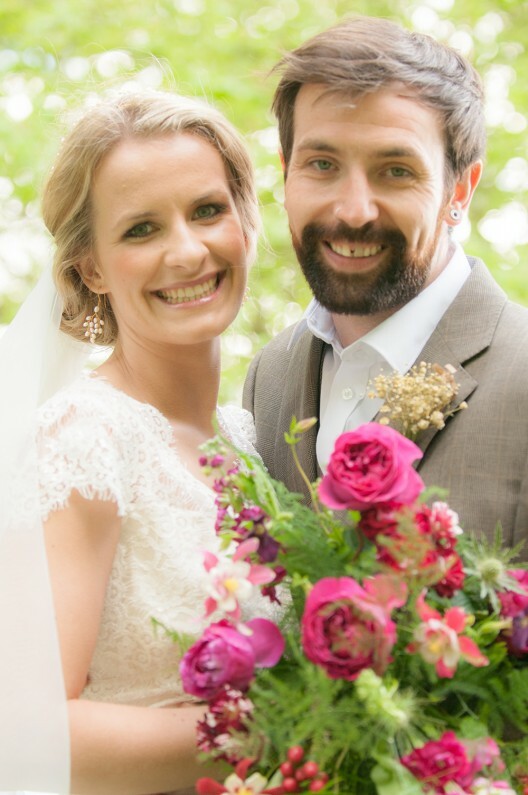 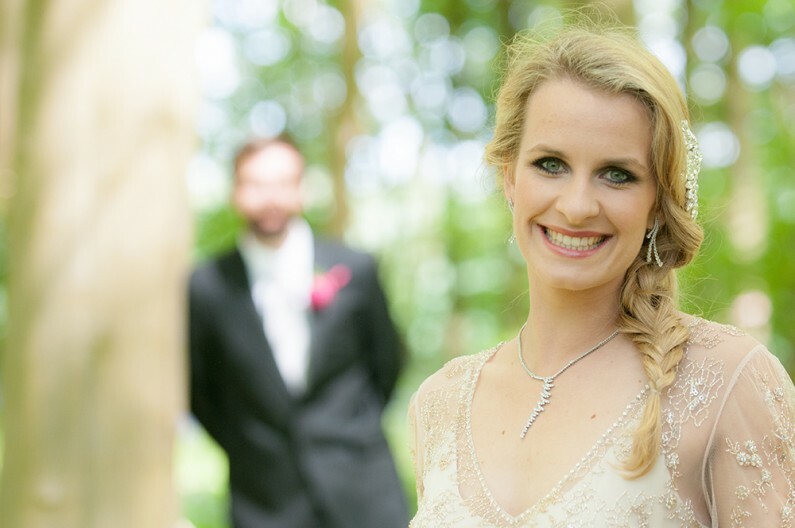 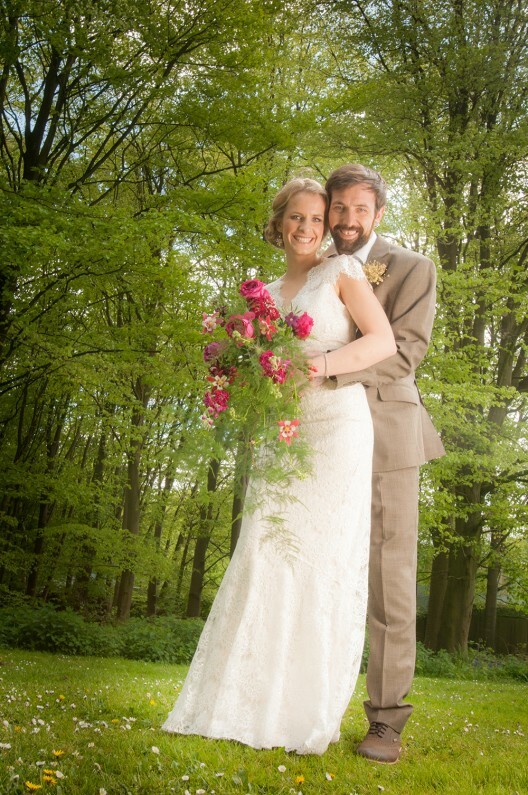 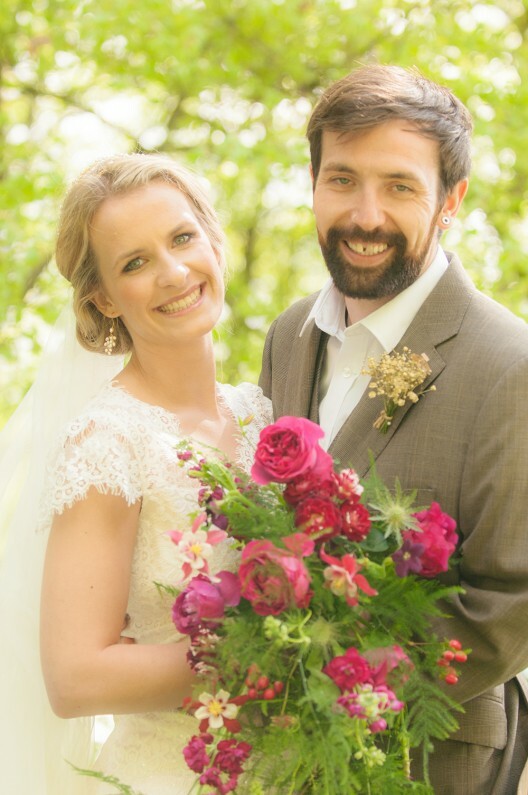 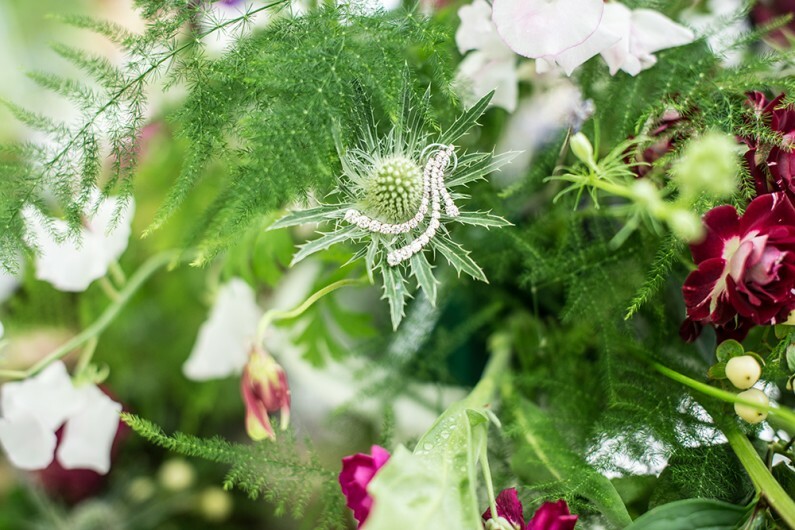 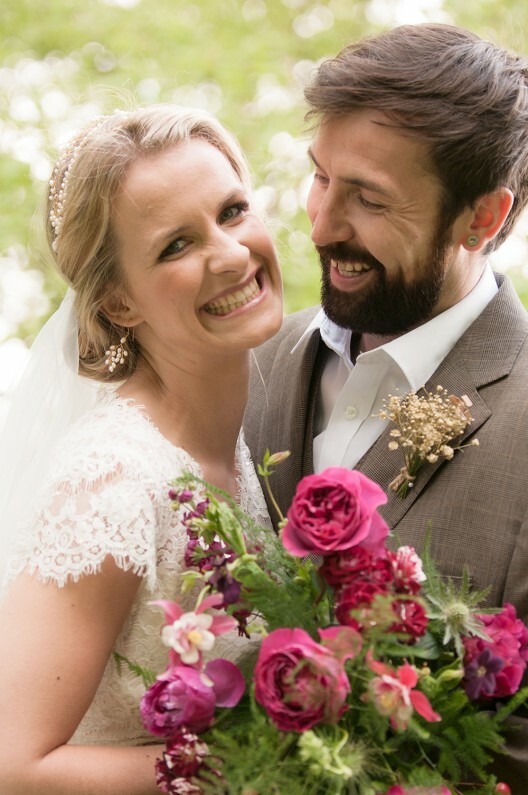 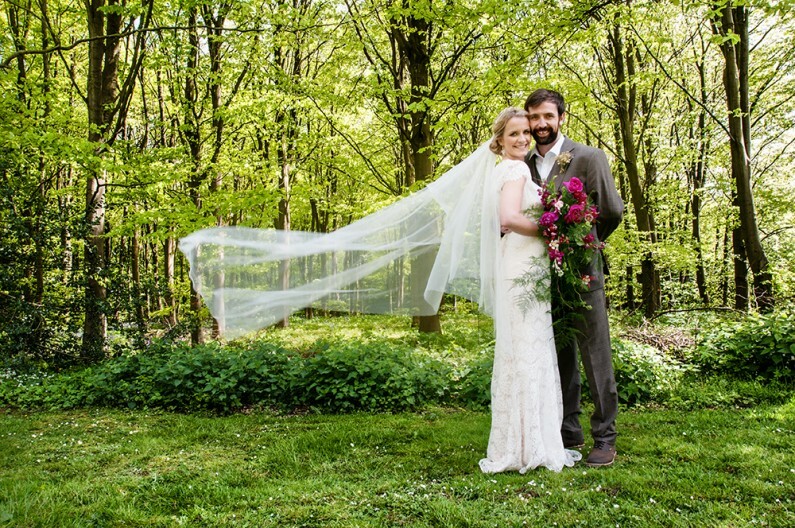 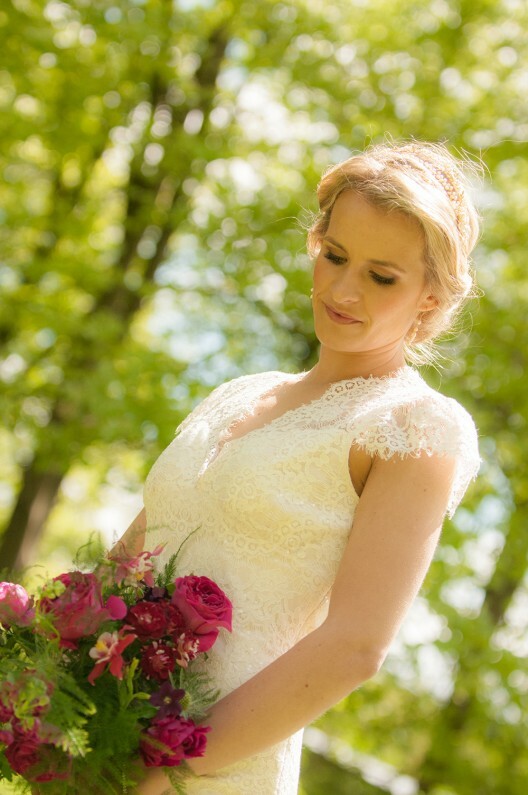 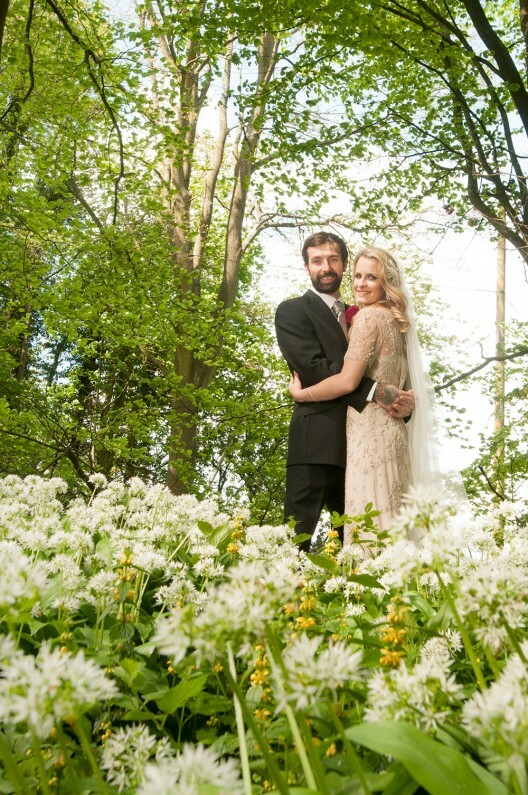 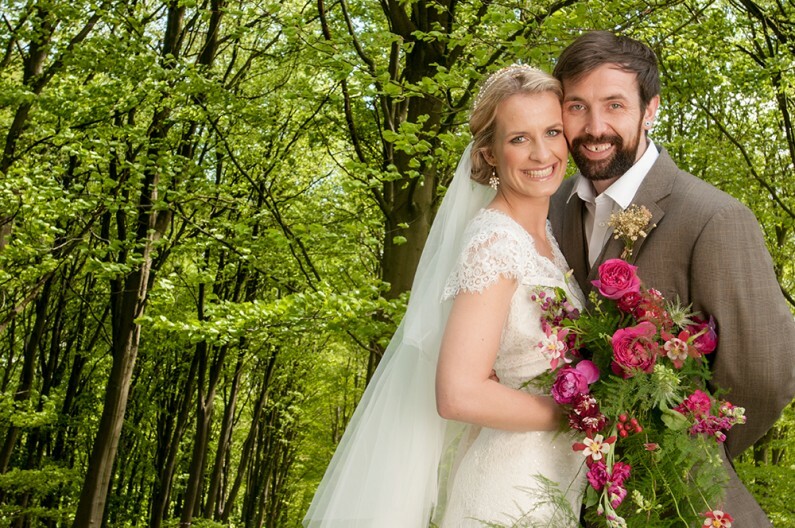 The bouquet I created for our bride was a gloriously old-fashioned cascade bouquet and I used plenty of ferns to create a flowing, natural feel. 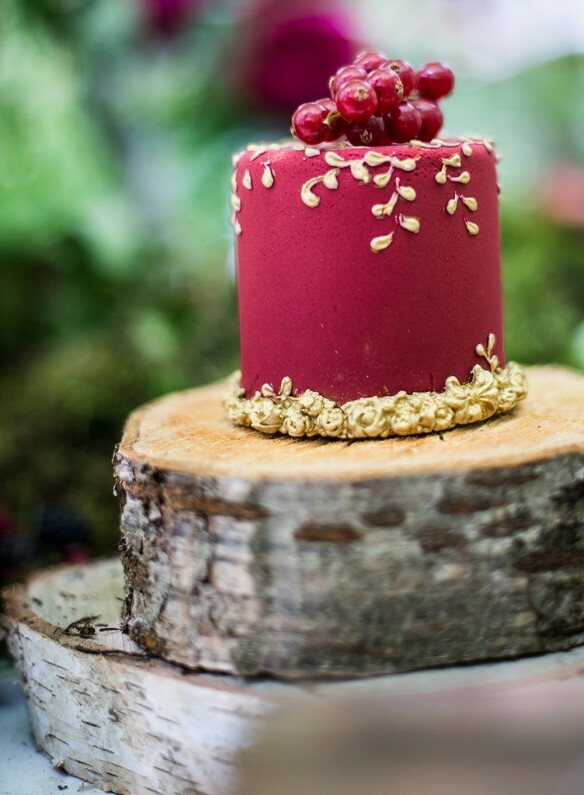 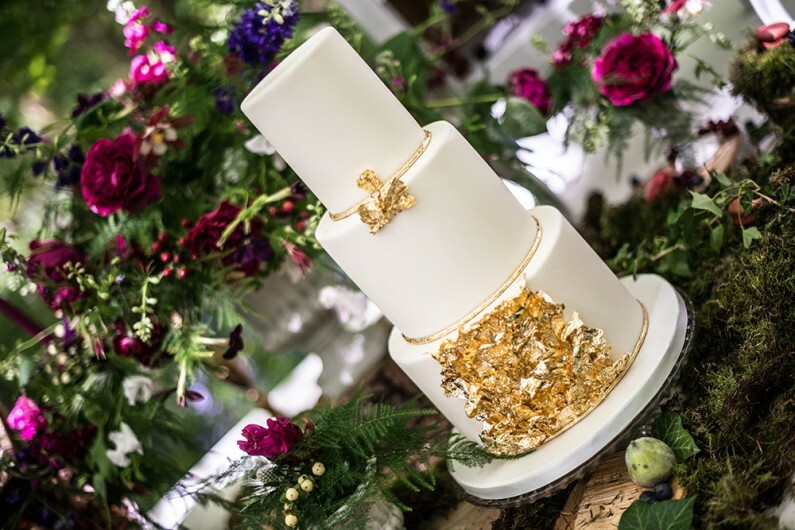 The rustic look was perfectly offset by an indulgent cocktail bar, fabulous stationery and the most amazing cake from Cakes By Krishanthi that echoed with luxe feel with lots of gold leaf and this became a stunning focal point to the dessert table. 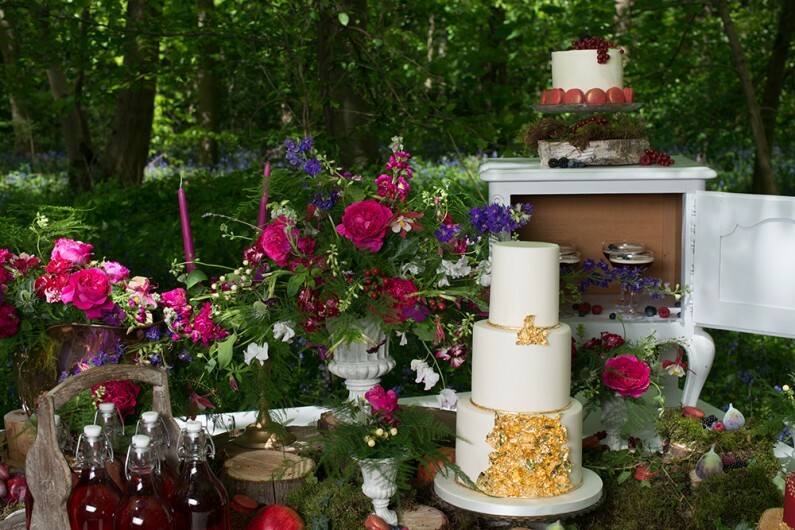 A huge thank you to Emma of Goose & Berry Luxe for inviting me to be part of such a special shoot.